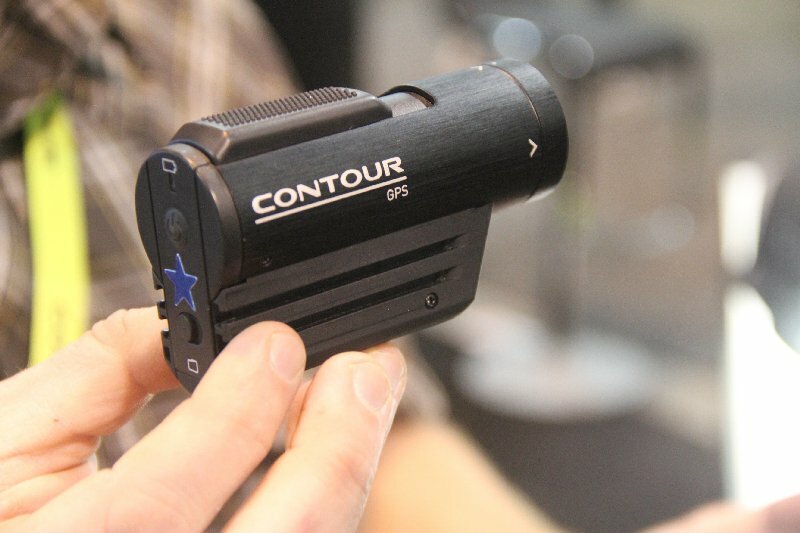 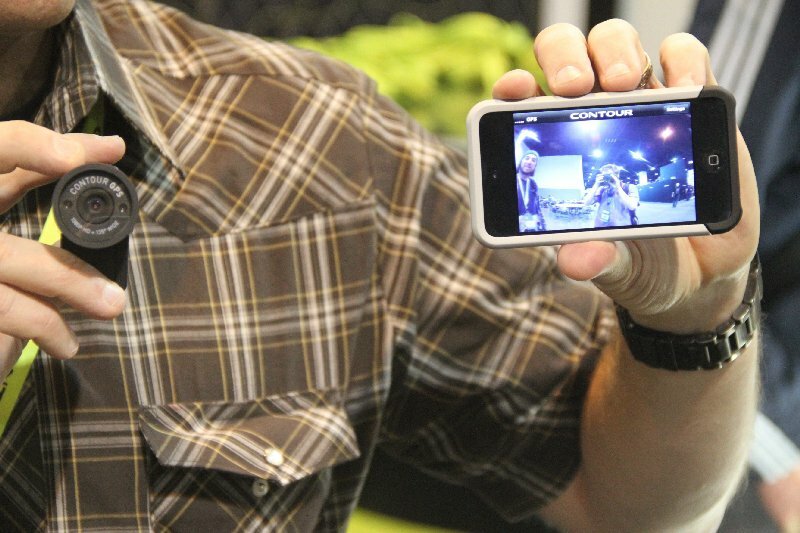 Bluetooth connection to your Smartphone for video preview and setting. 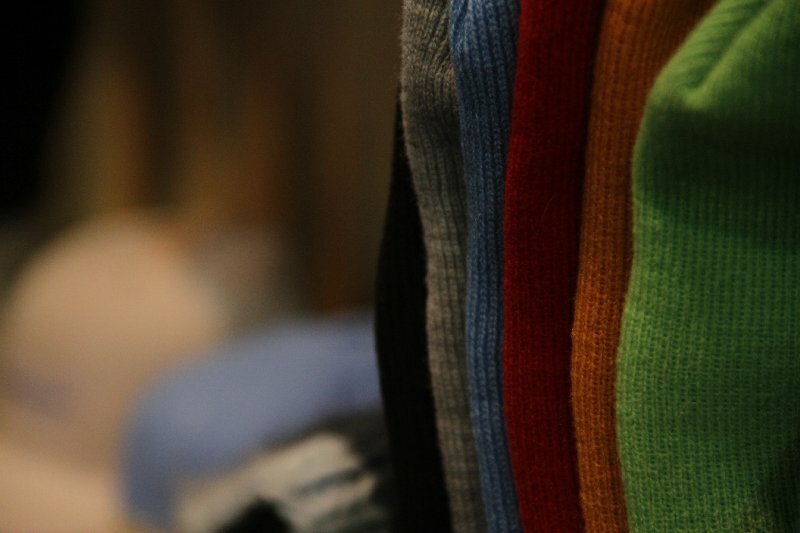 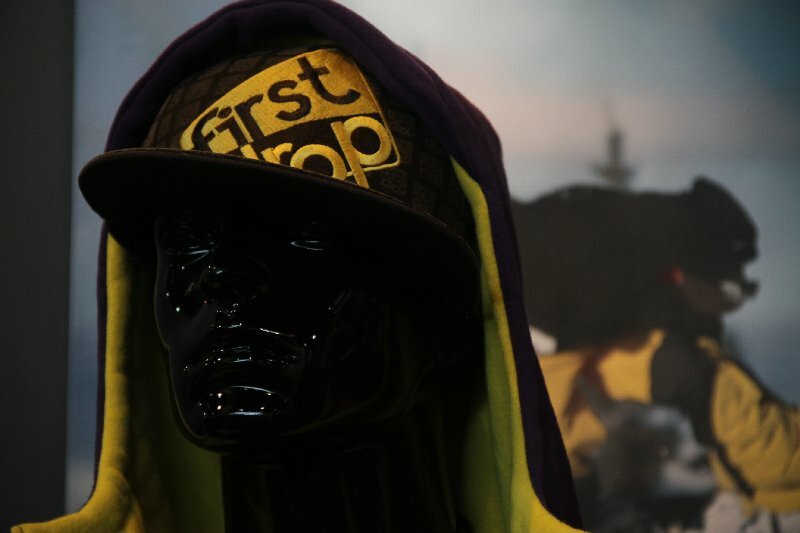 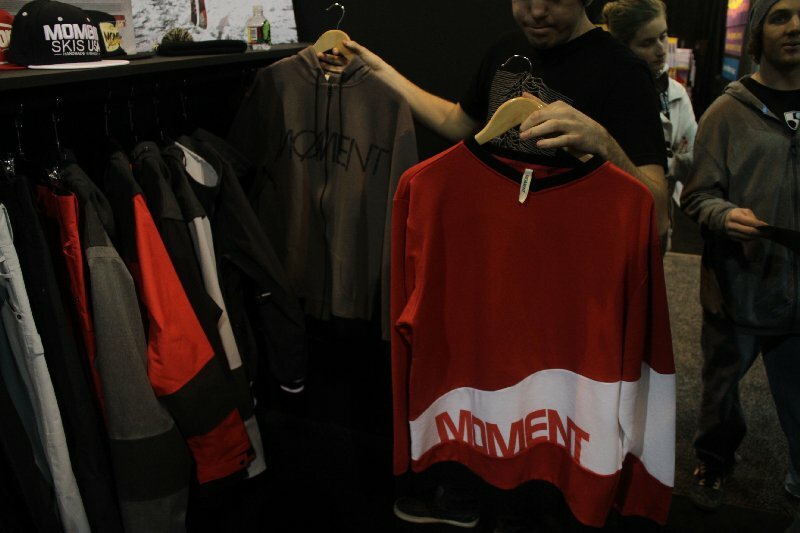 A look at First Drop outerwear's new line with David Lesh along with the latest and greatest on the company. 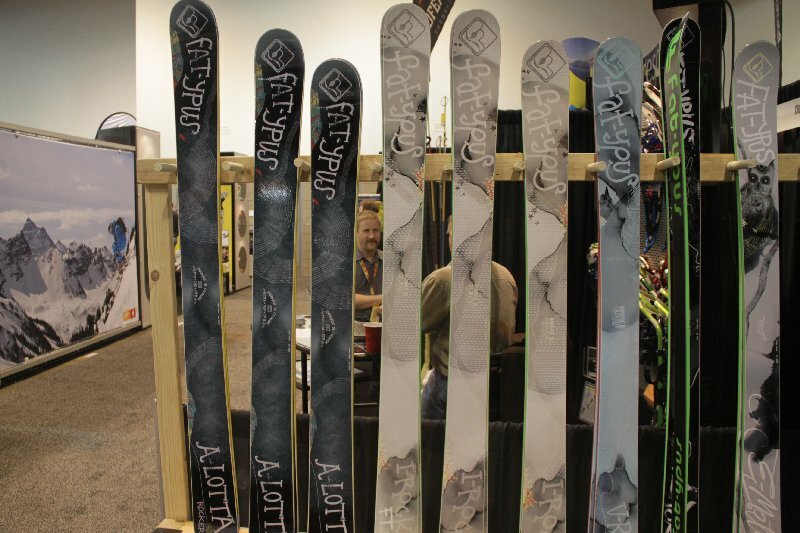 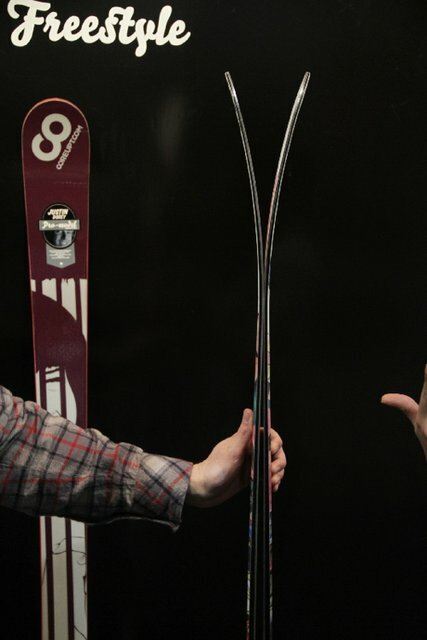 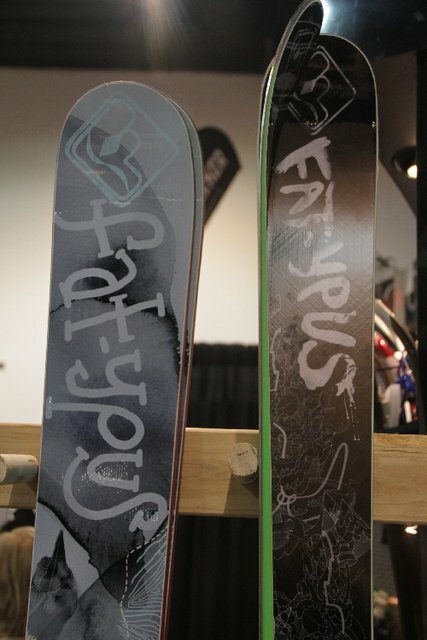 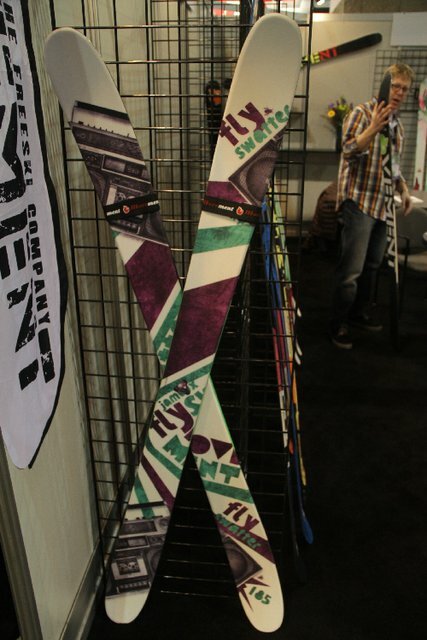 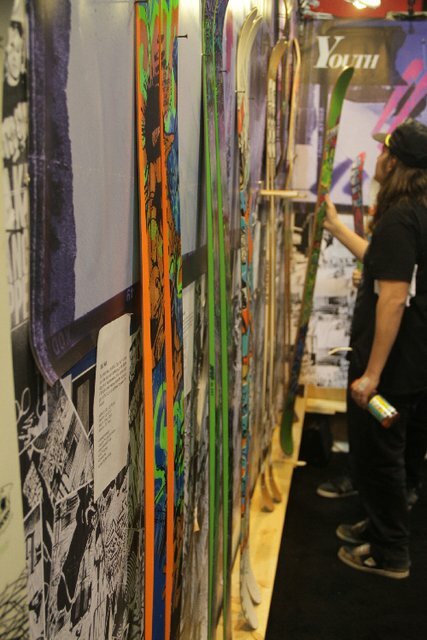 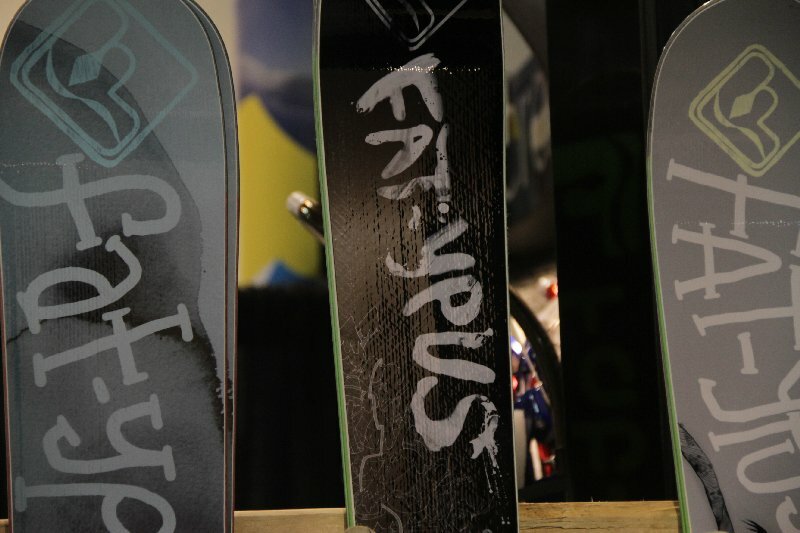 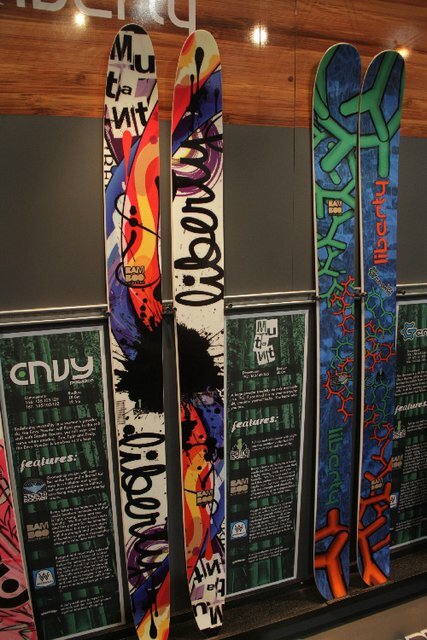 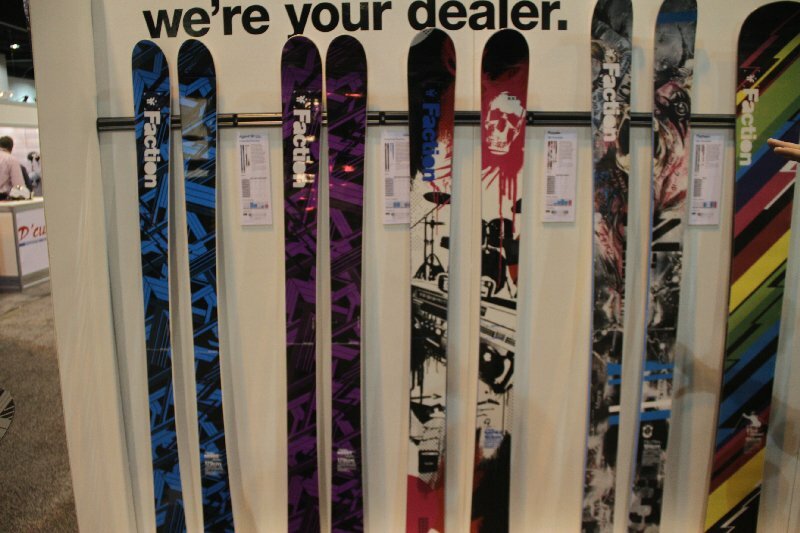 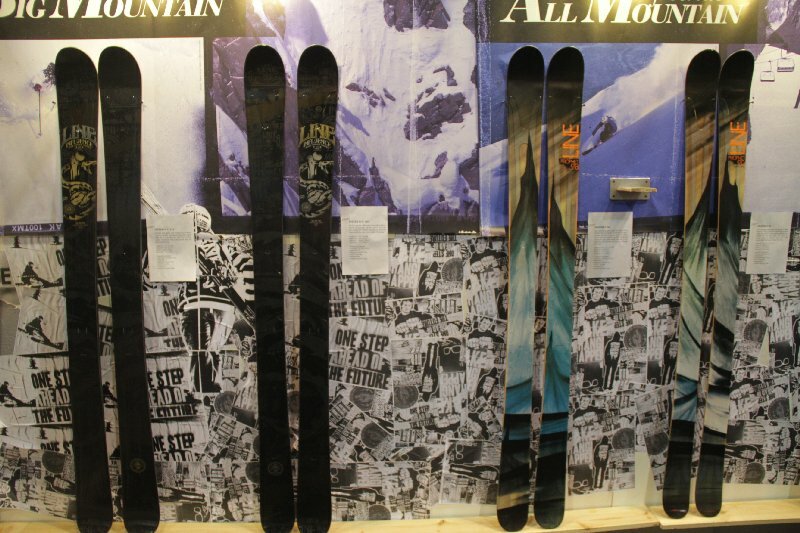 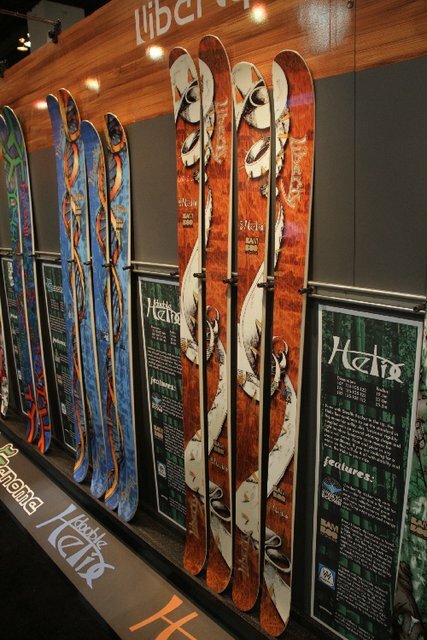 Josh Malczyk shows off the new line of Full Tilt's, including Wallisch's new Hot Dogger. 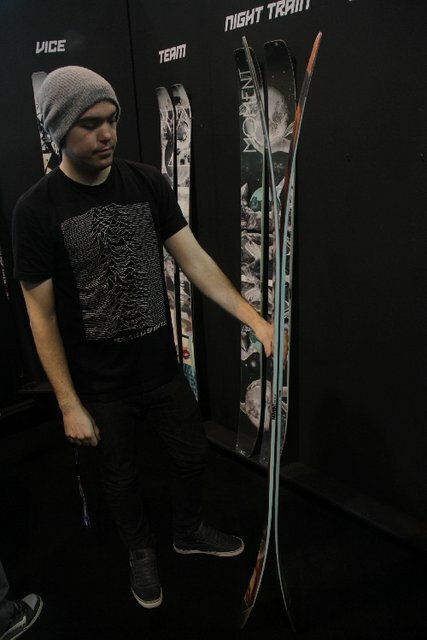 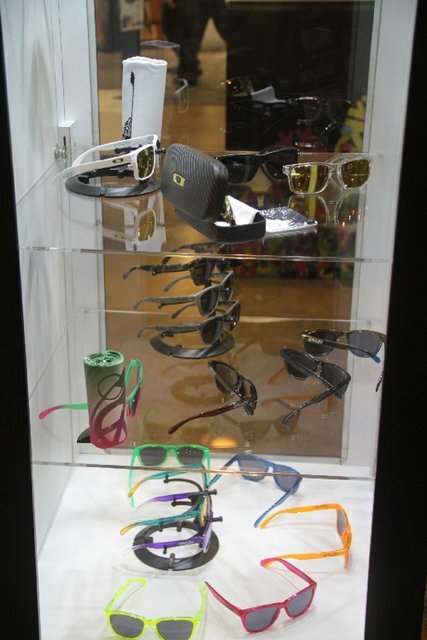 The always entertaining Ashley Hart takes us through Icelantic's new line of product. 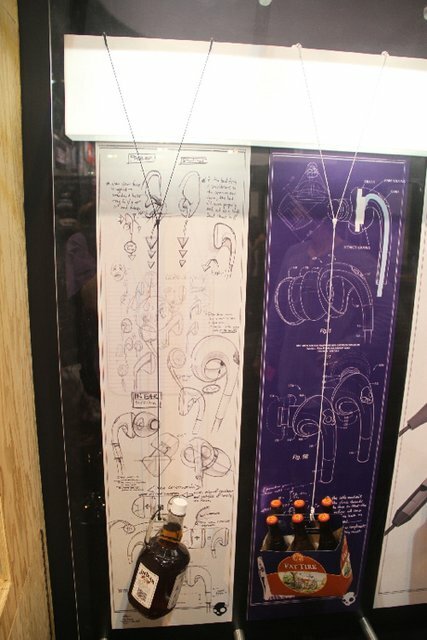 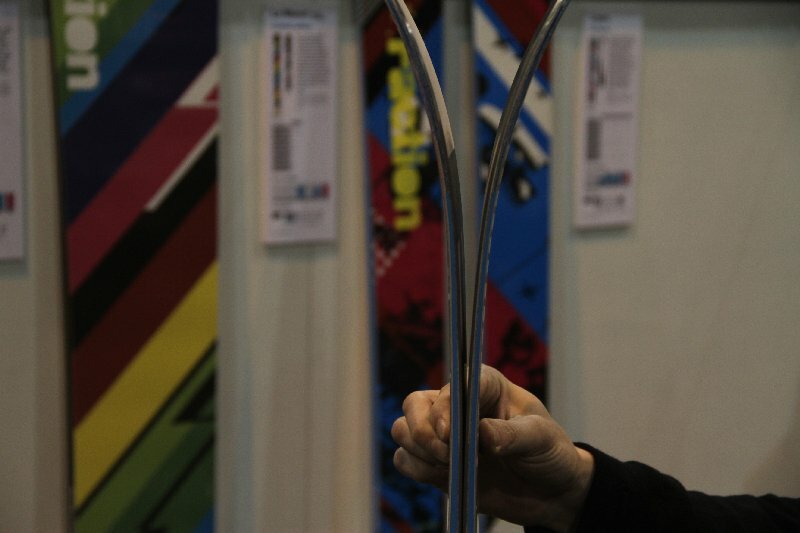 Line's Pointy Sticks with Grips! 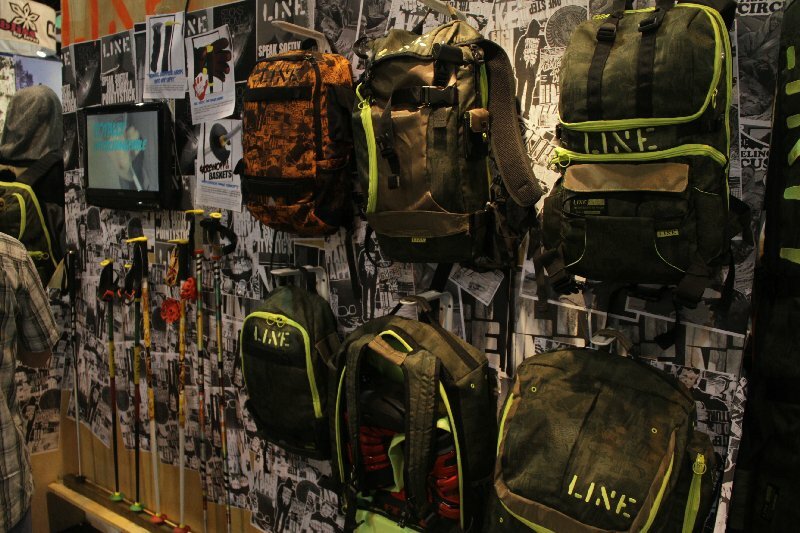 Jason Levinthal, the man behind the monkey mask at Line, gives us a run down on Line's entire product line, from the new Afterbang's to the poles and everything in between. 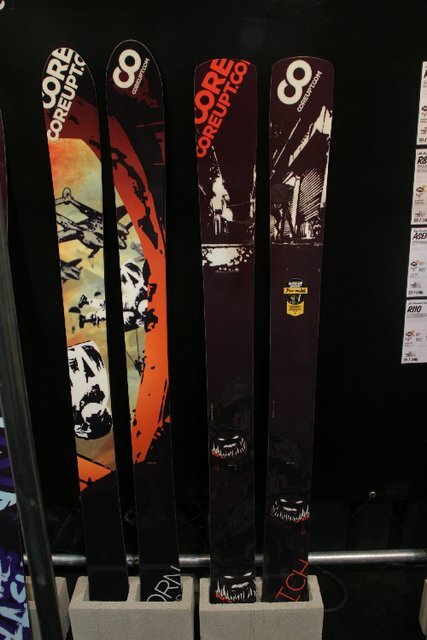 The Fly Swatter, 150/125/145 with early rise in the tip and tail. 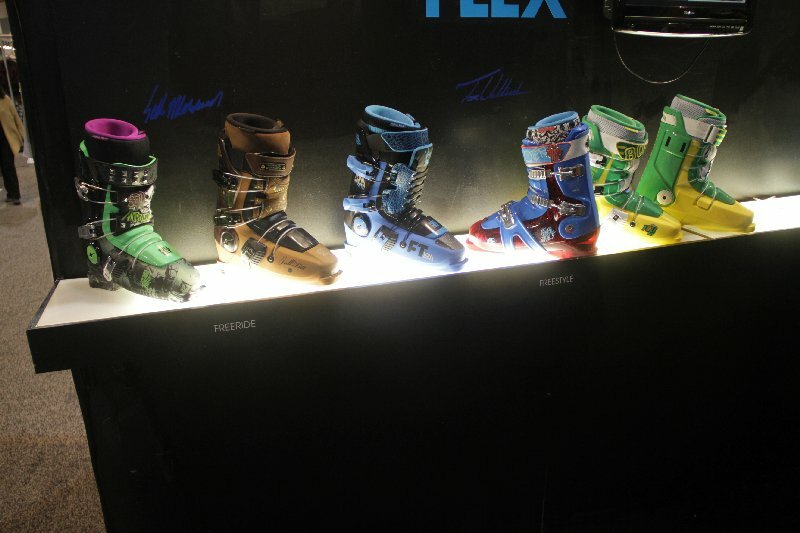 The Super Turbo, Trust, Sluff, Source, and Jam on the men's side, and the Tattoo and Flair for the ladies. 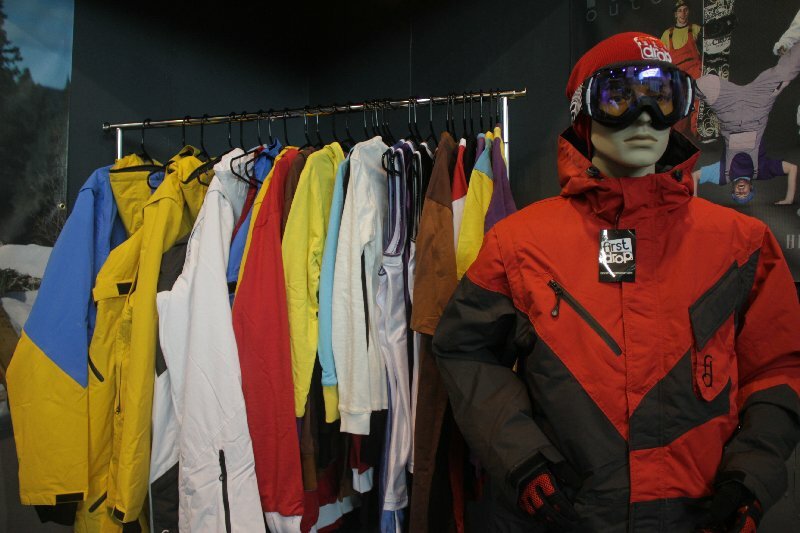 The new Xavier Bertoni Pro Model jacket has a number of comical features, and is designed with a tall, comfortable fit. 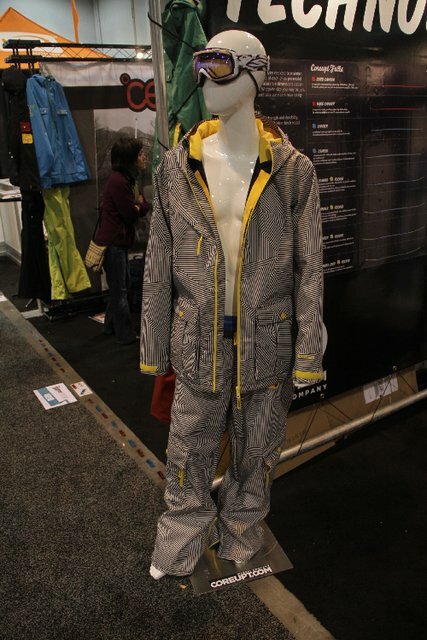 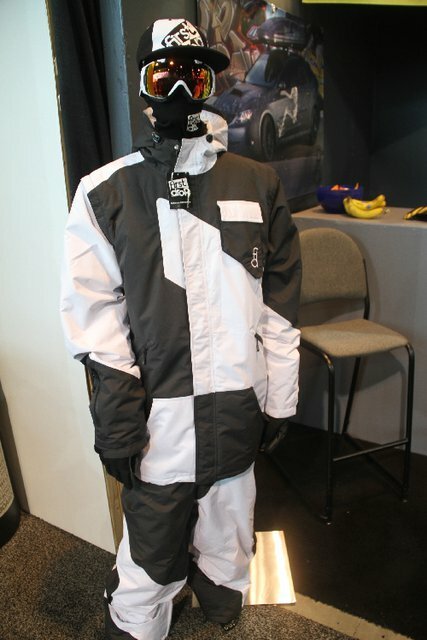 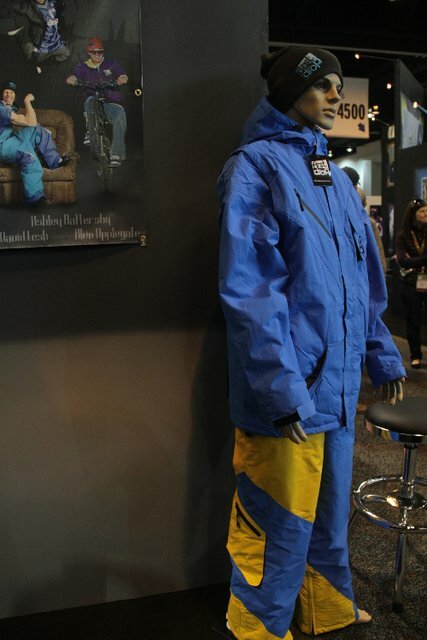 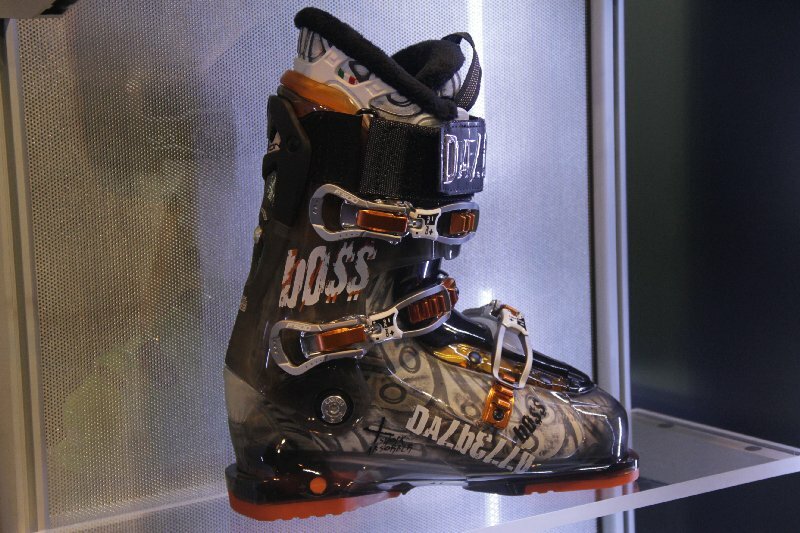 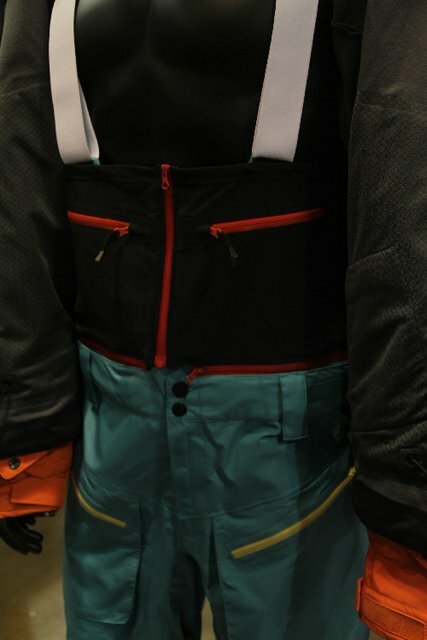 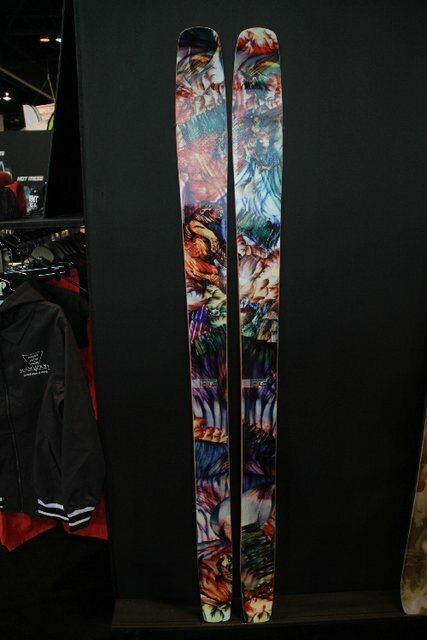 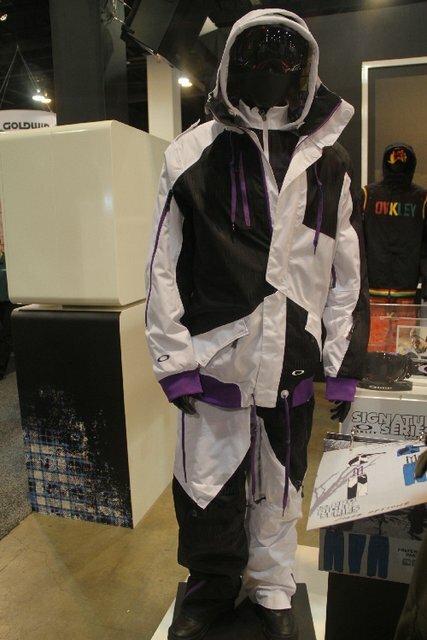 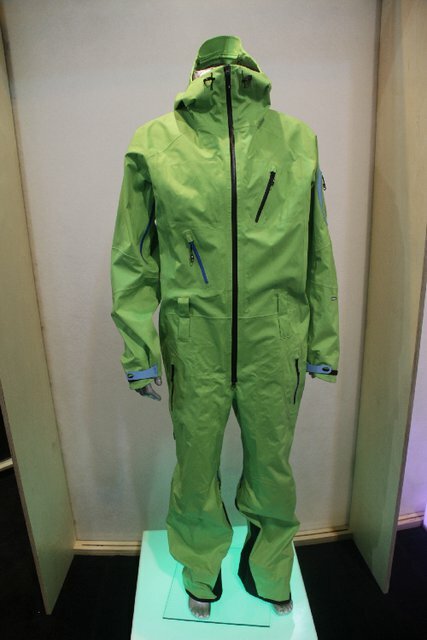 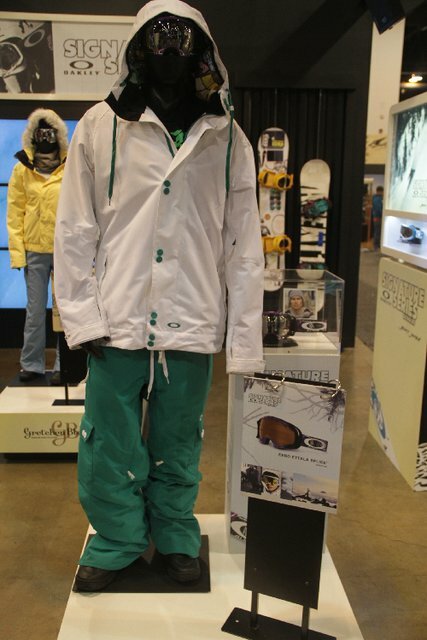 Phil 'B-Dog' Casabon is one of the steeziest skiers around, so his suit must, ahem, follow suit. 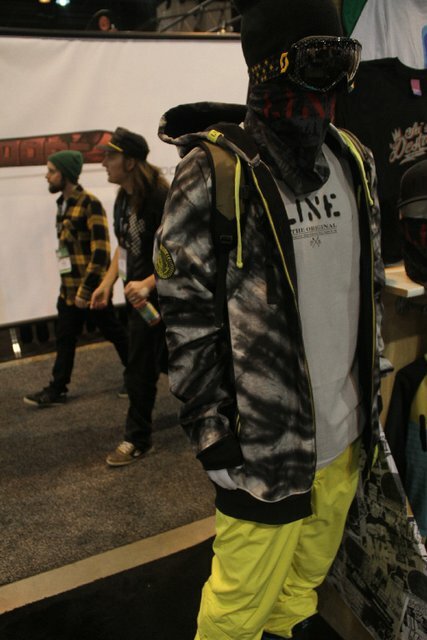 Simple, but stylish. 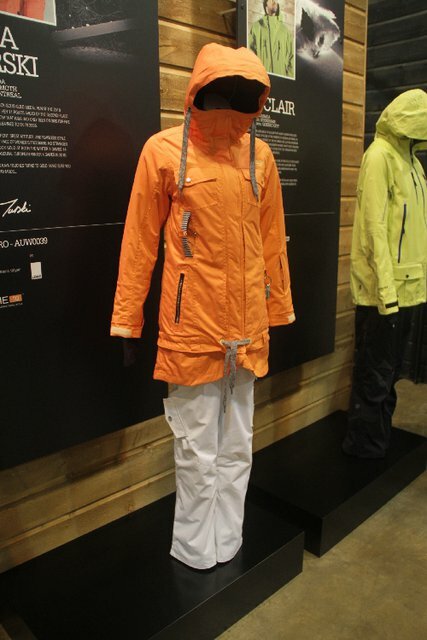 Kaya Turski has designed a very feminine and appealing jacket, with a removable tall skirt and bright orange colorways. 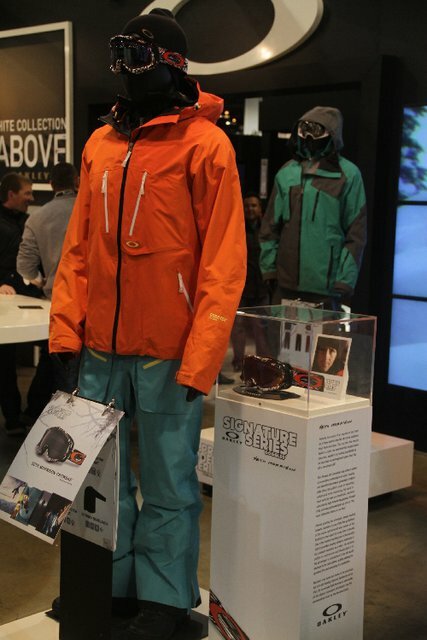 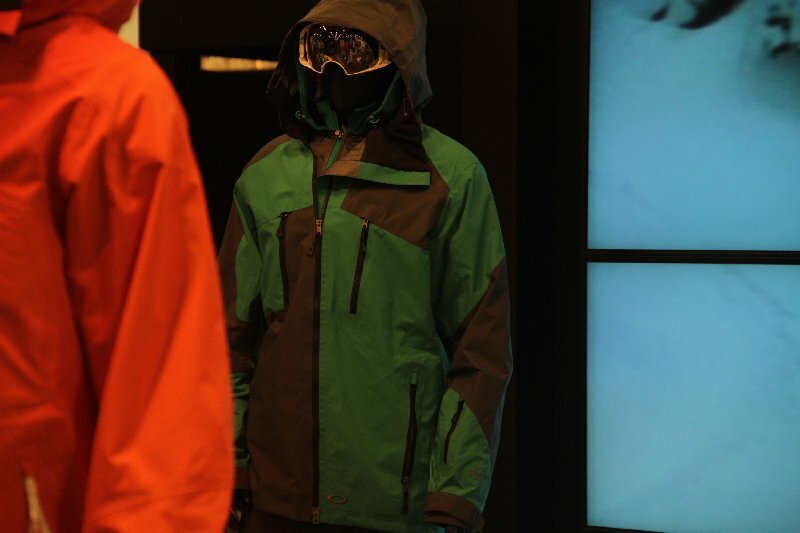 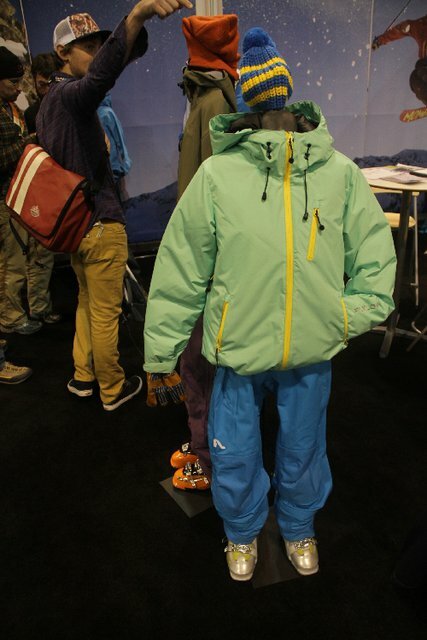 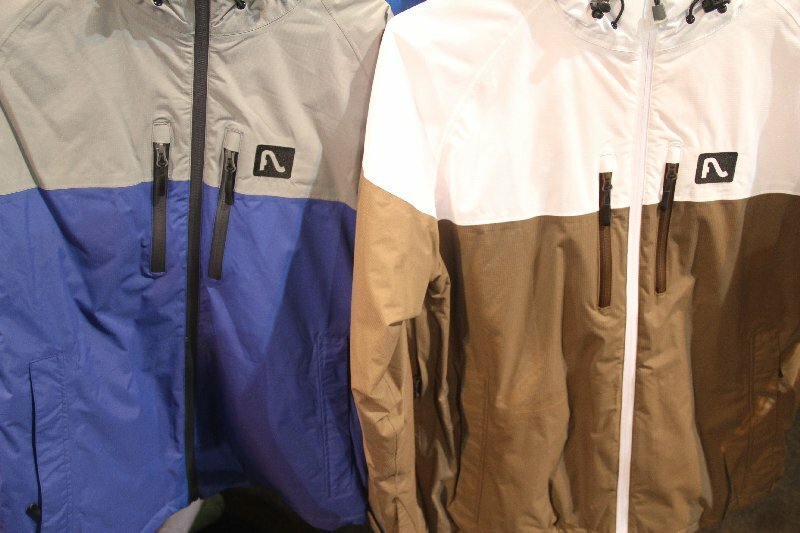 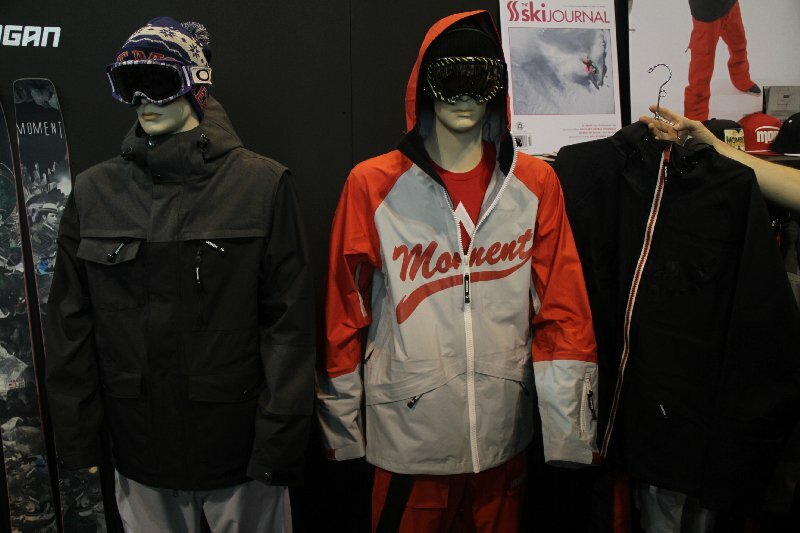 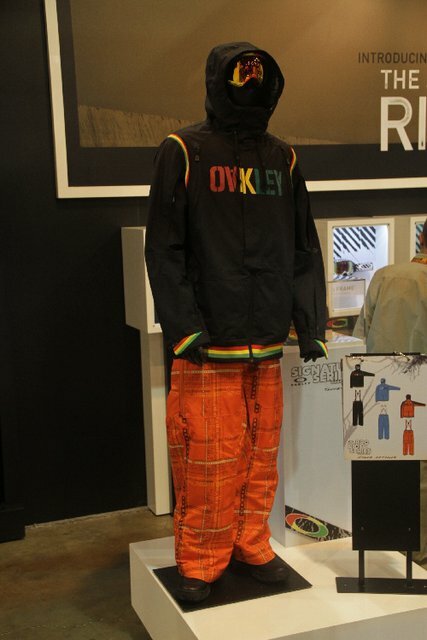 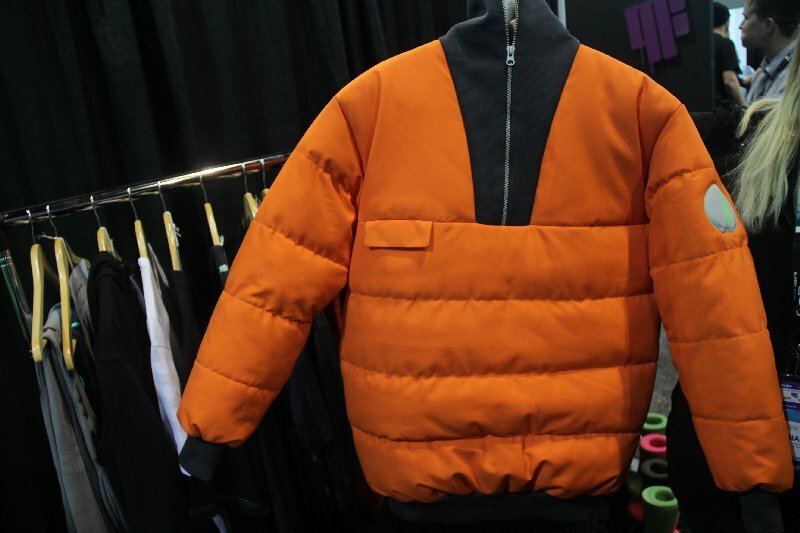 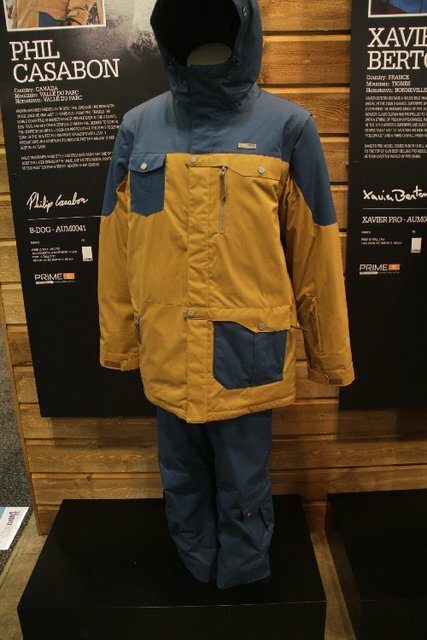 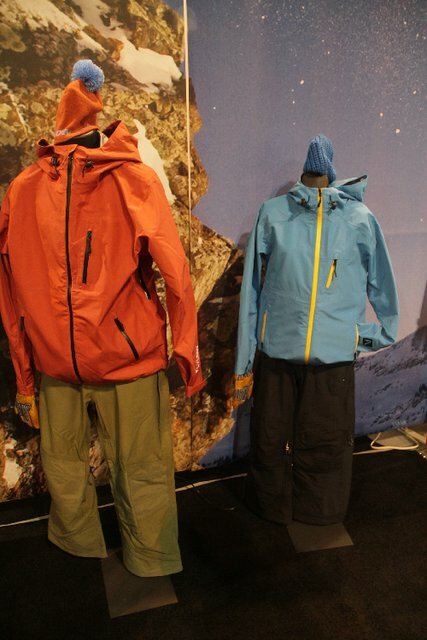 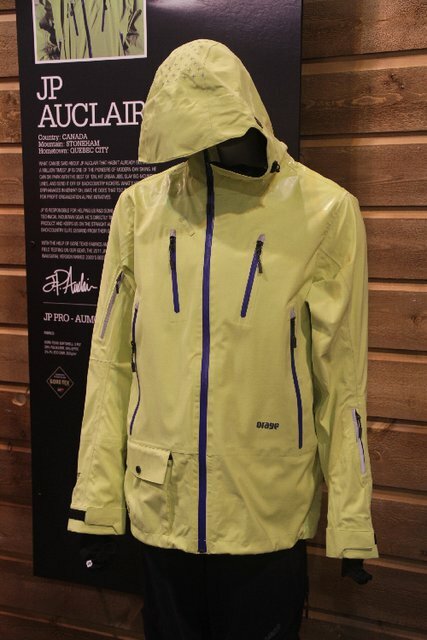 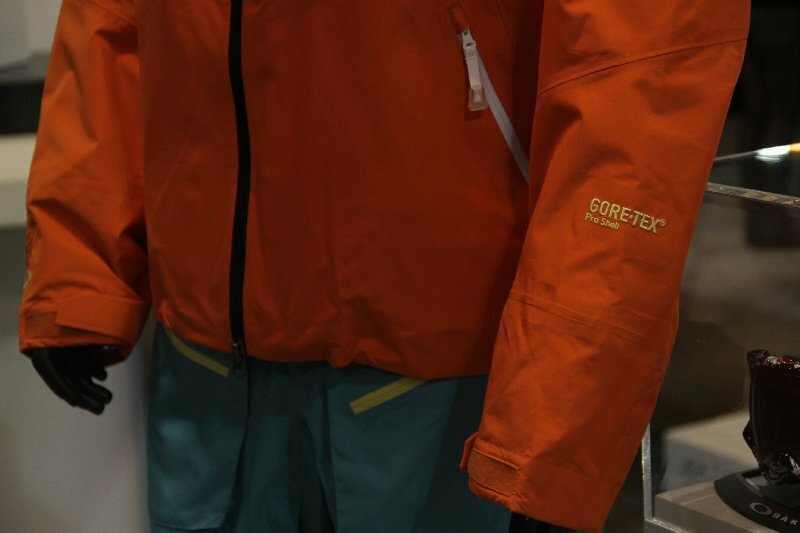 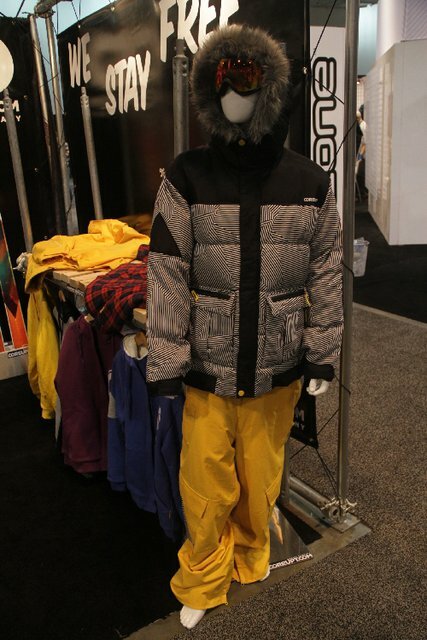 The JP Auclair/Retallack collab is full Gore-Tex, taped seams and a regular fit. 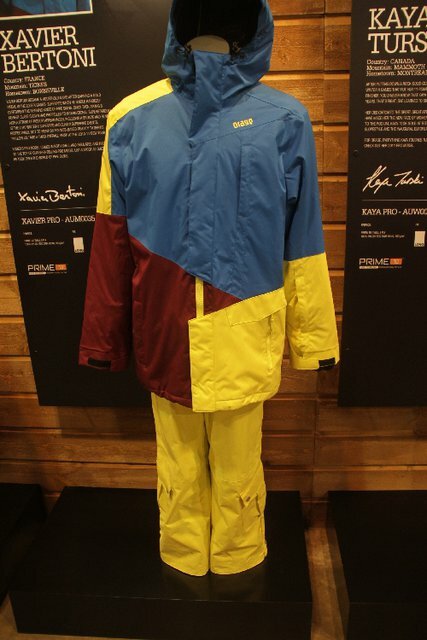 Fit for a legend. 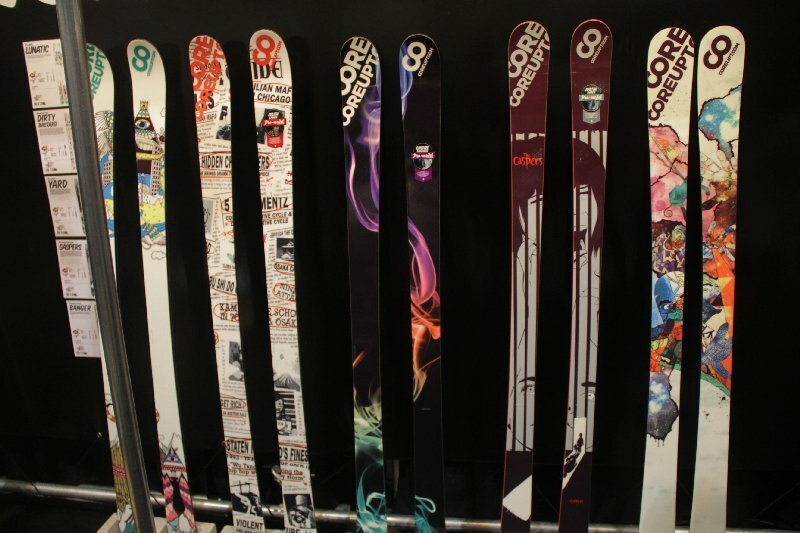 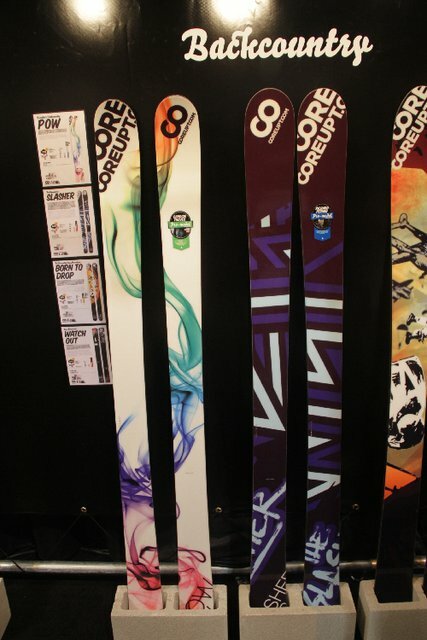 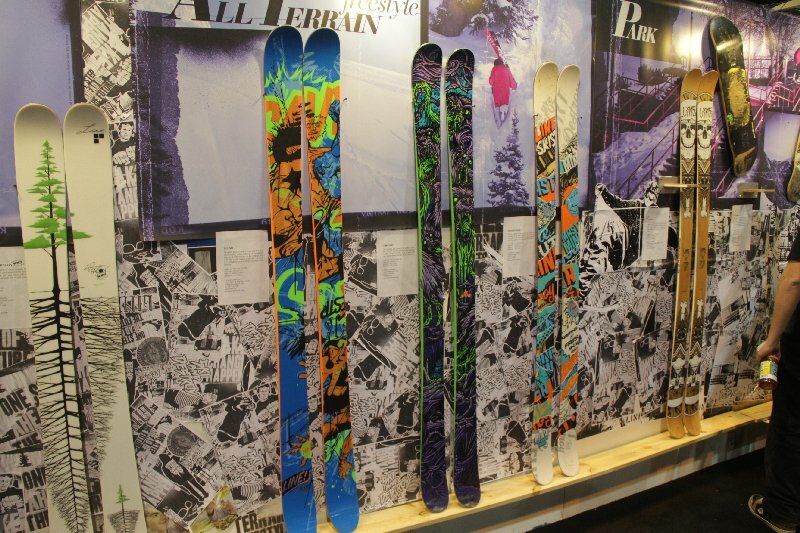 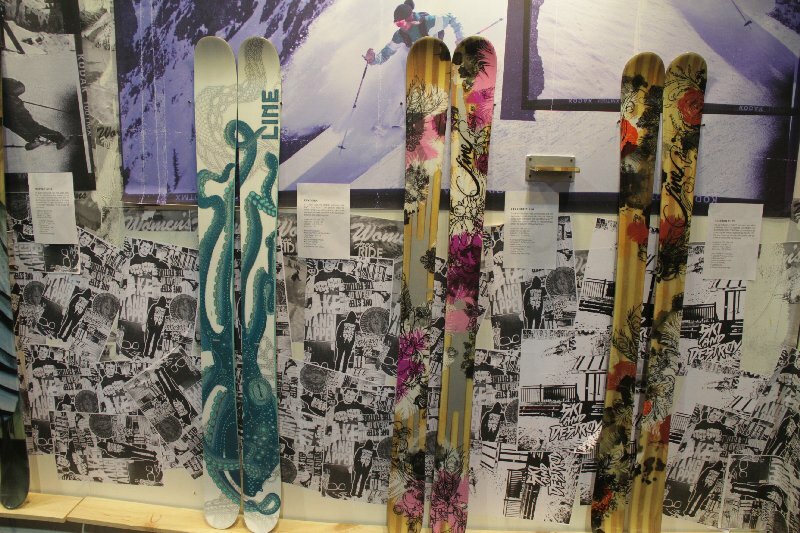 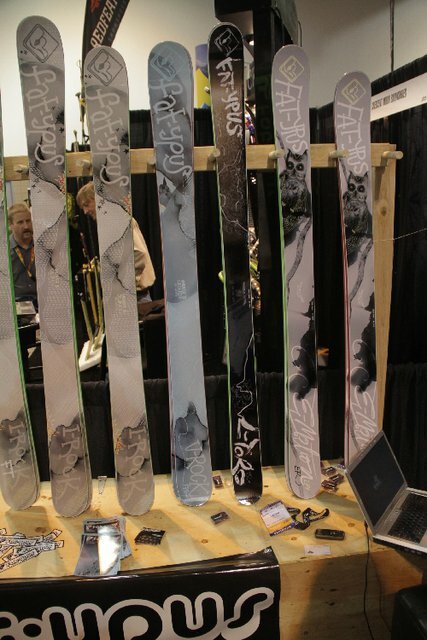 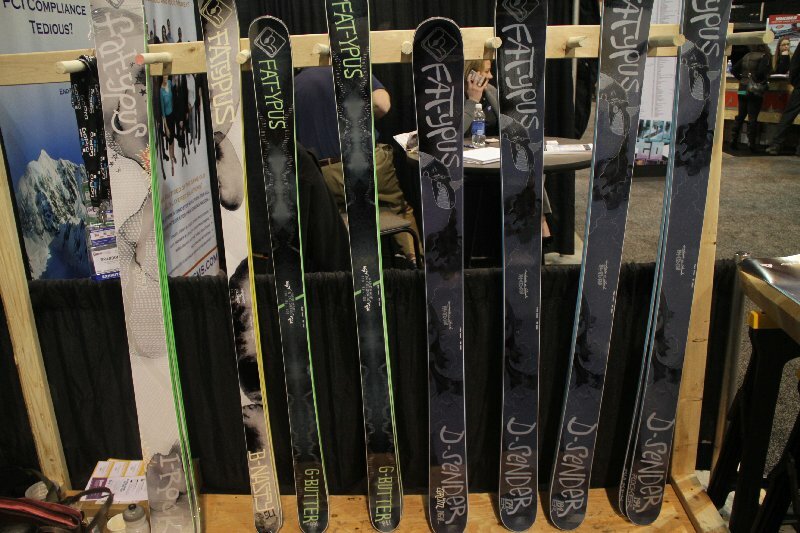 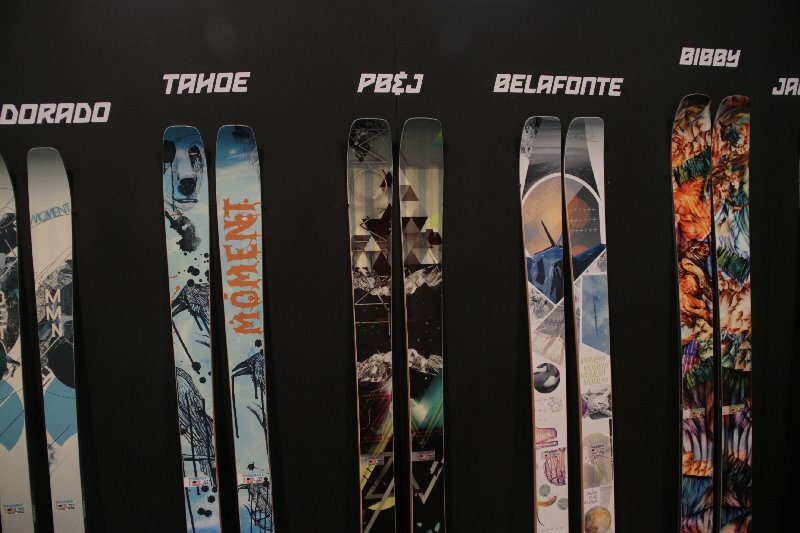 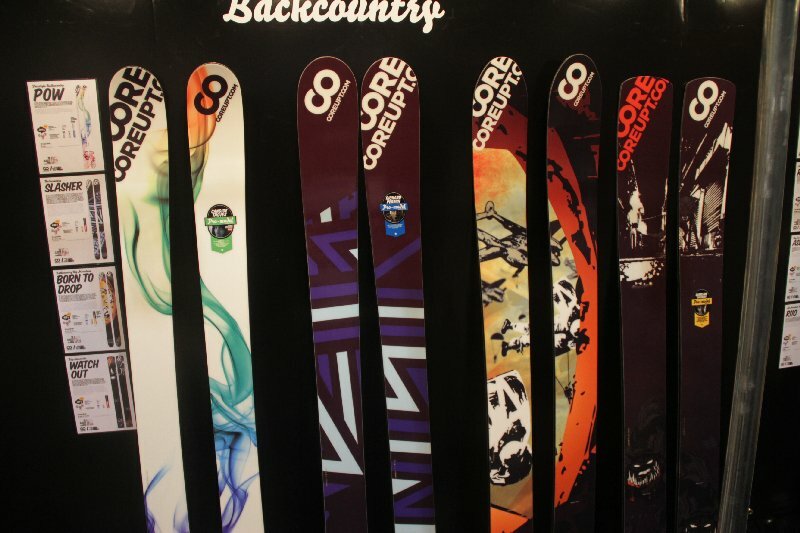 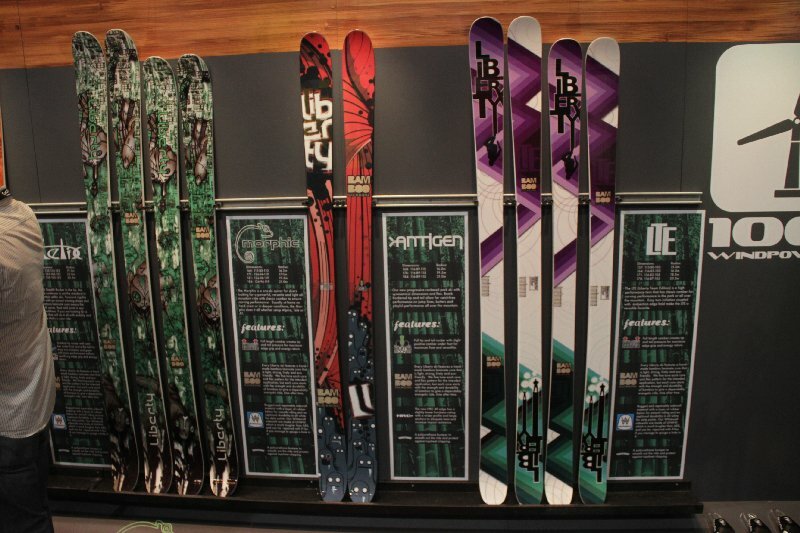 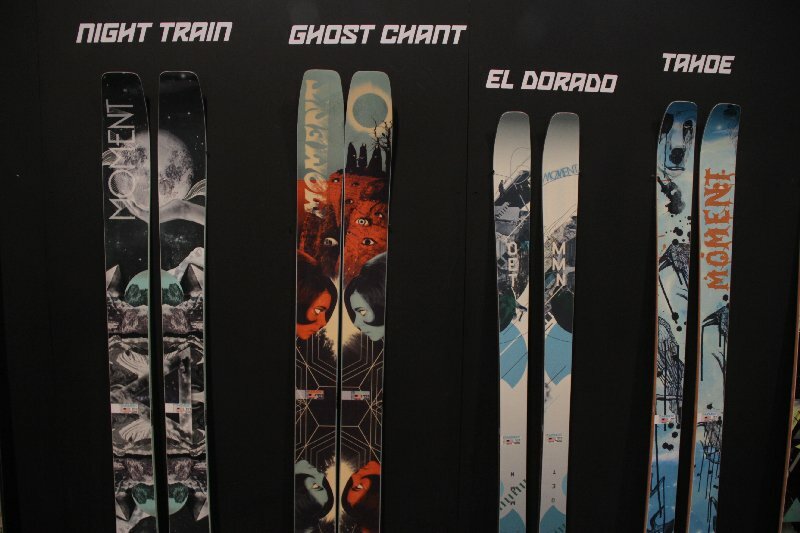 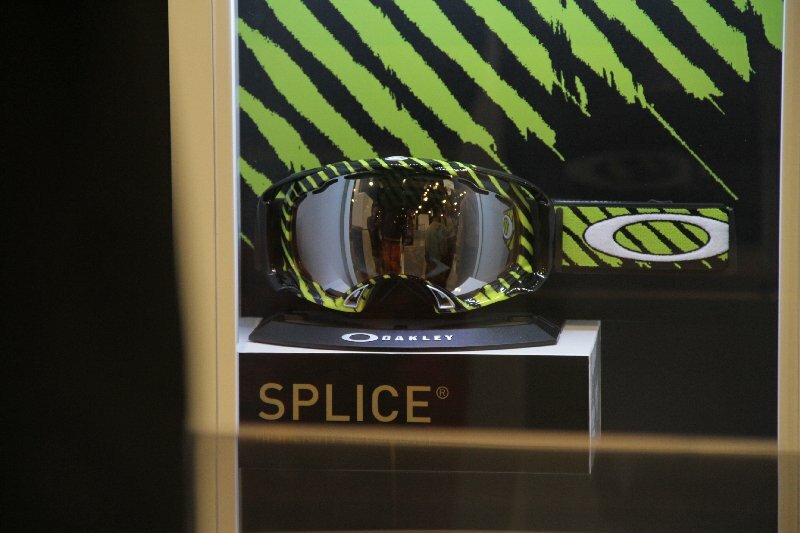 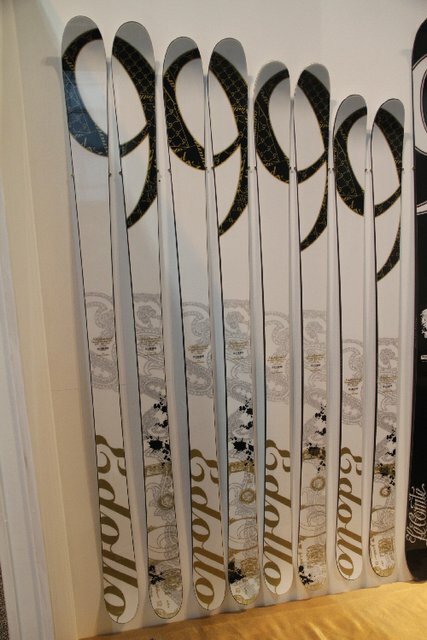 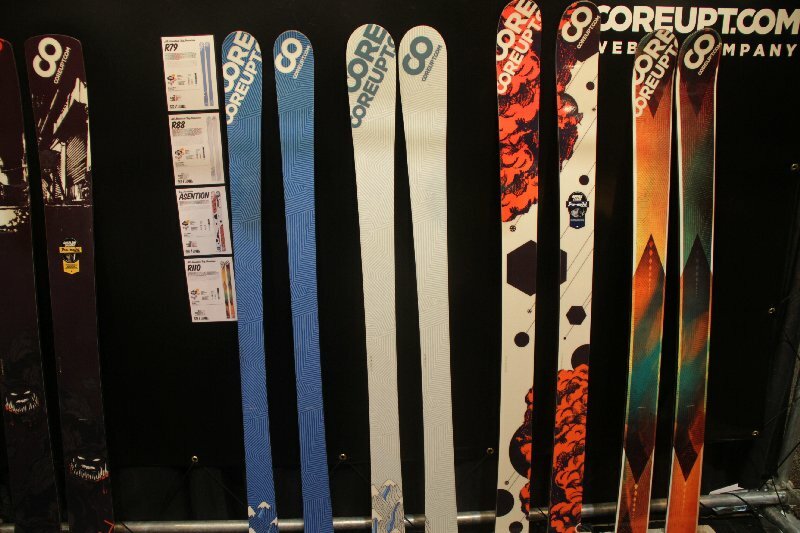 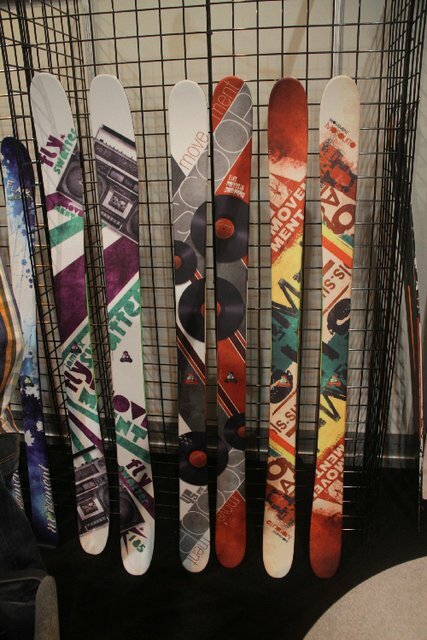 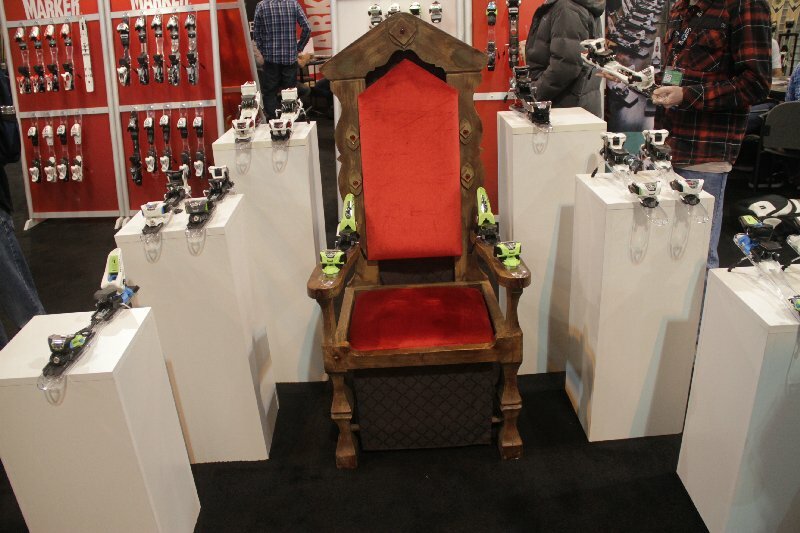 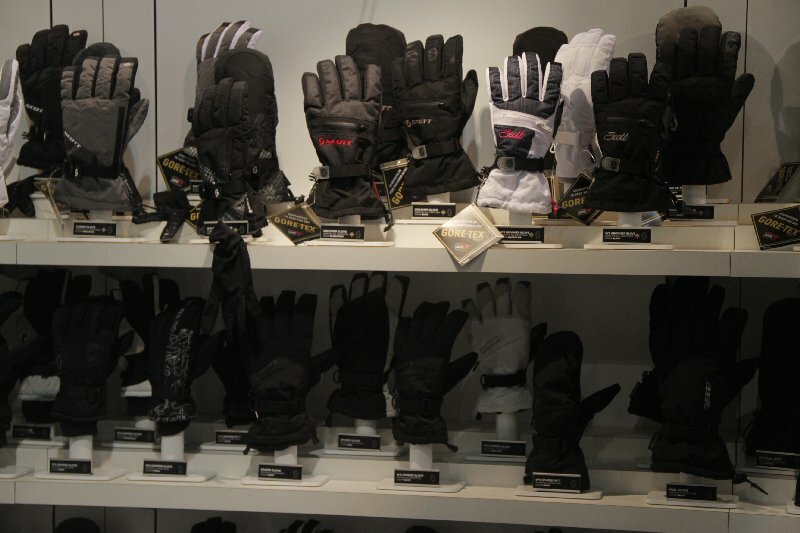 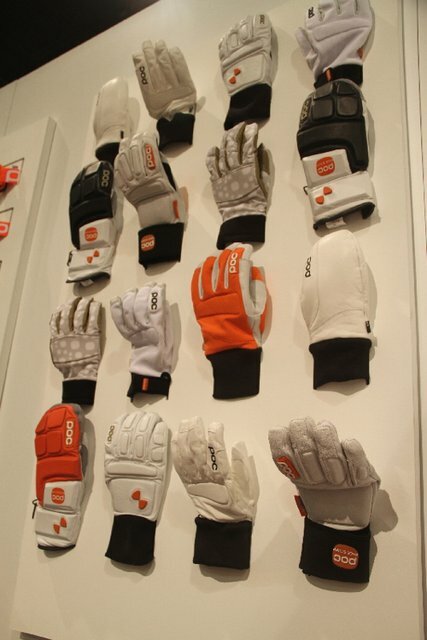 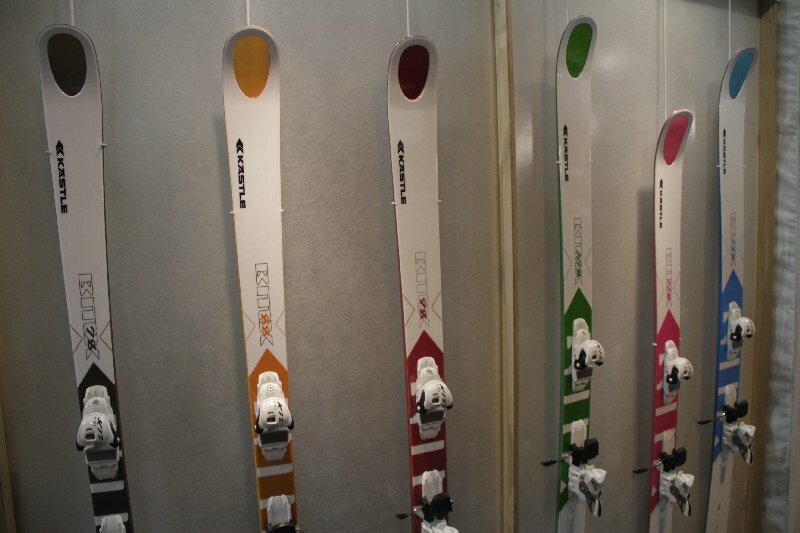 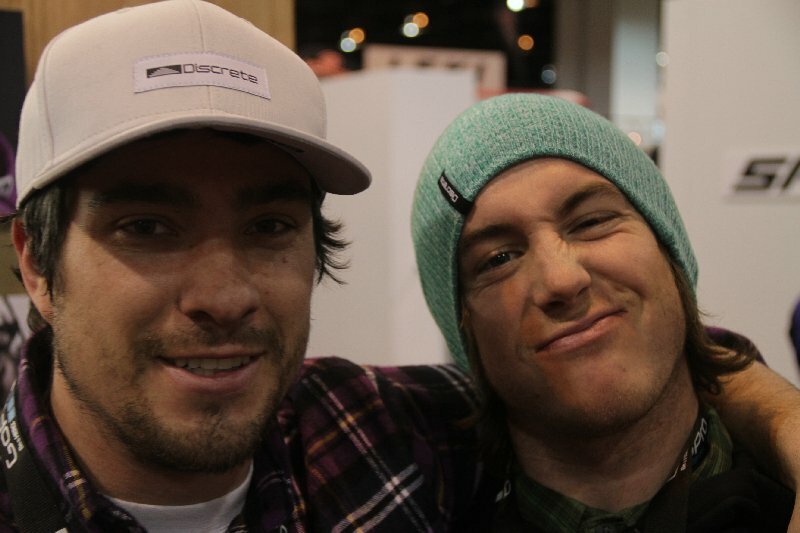 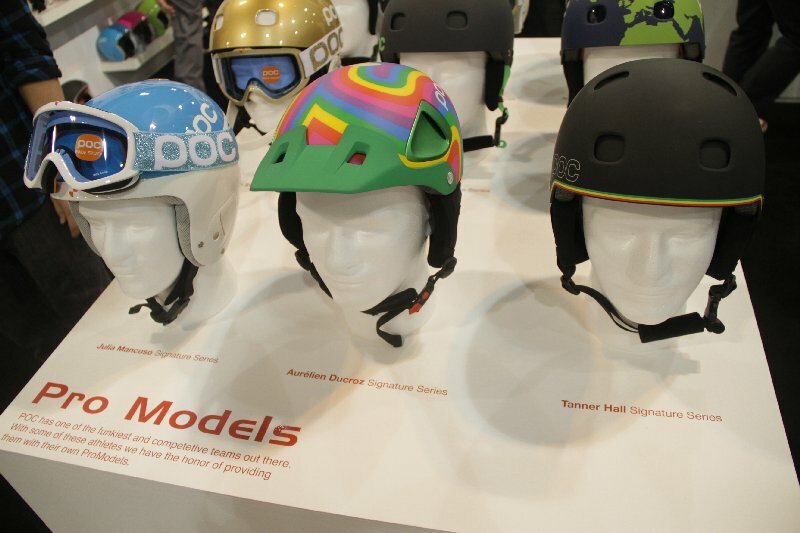 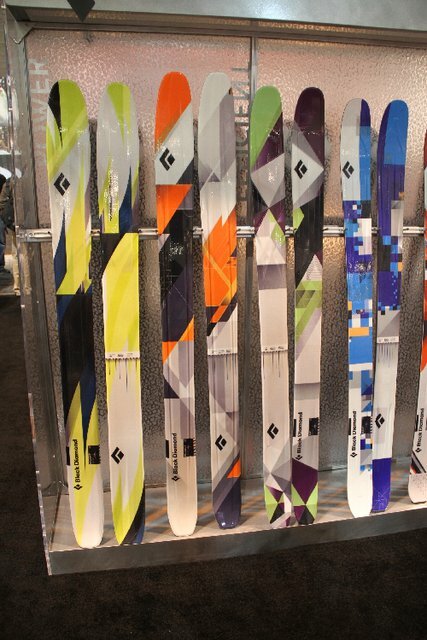 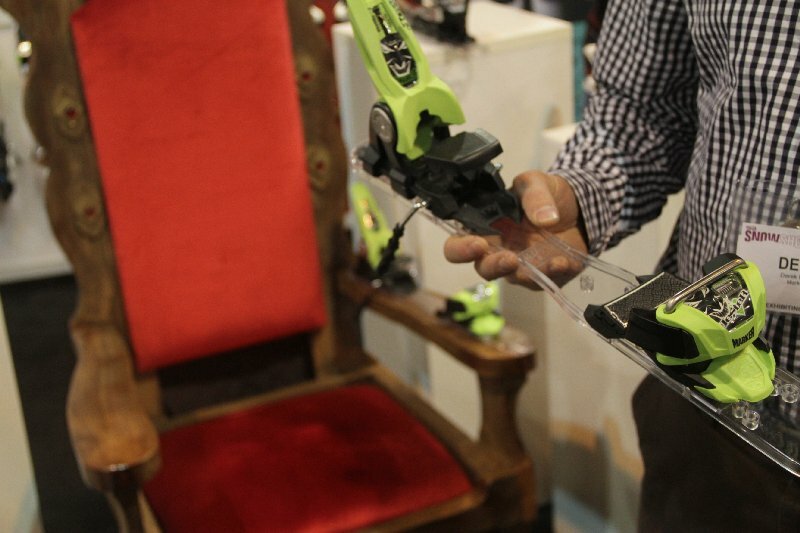 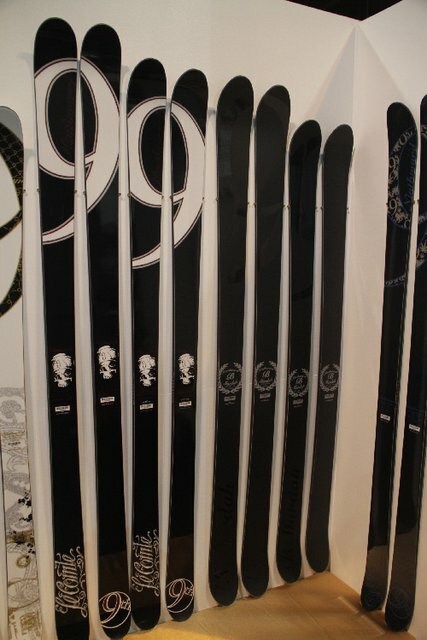 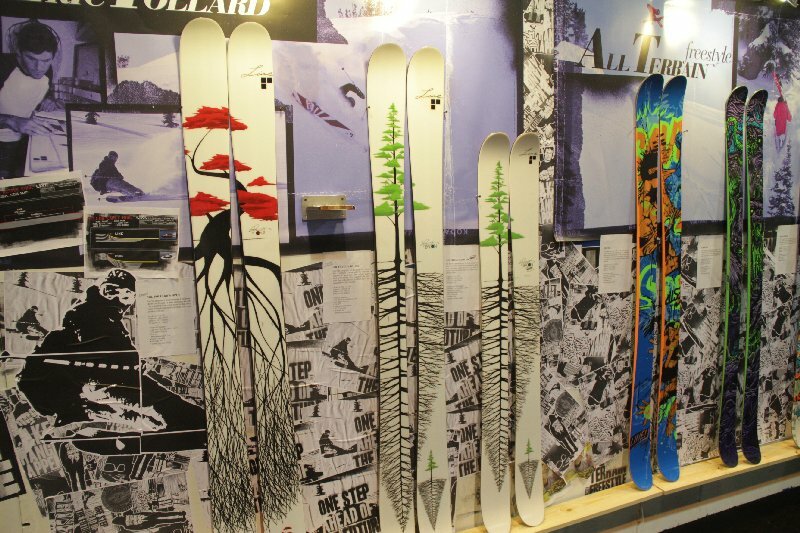 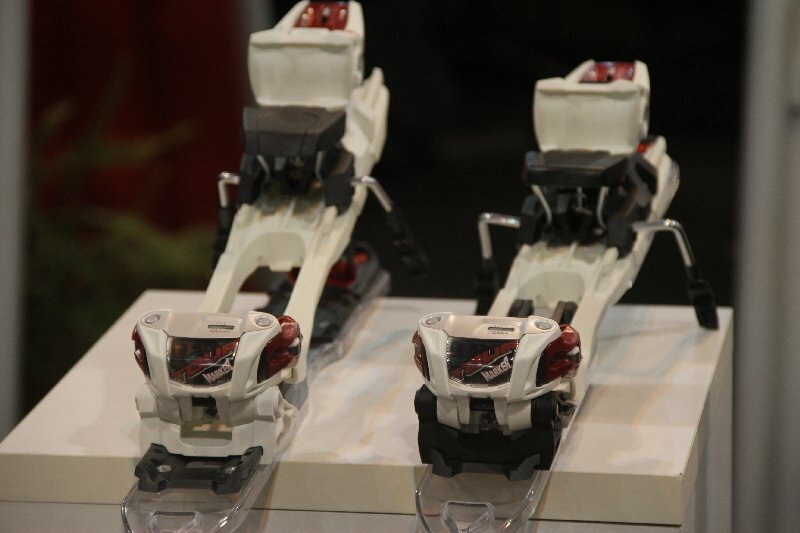 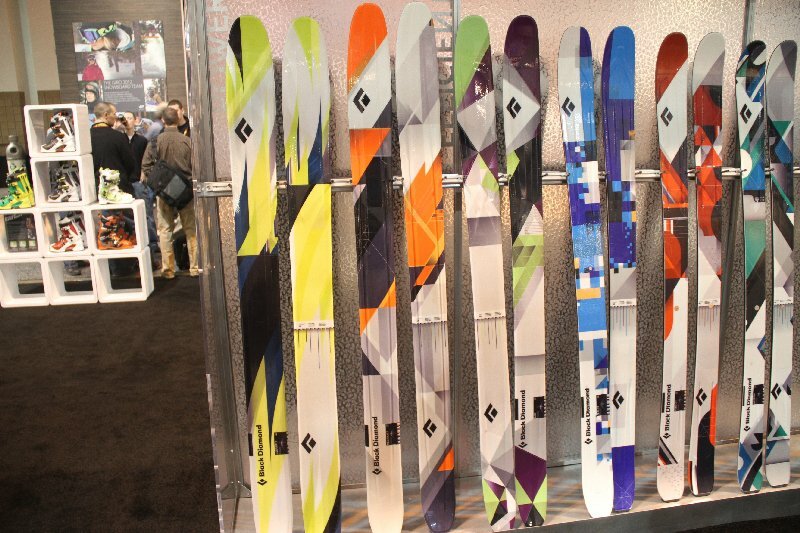 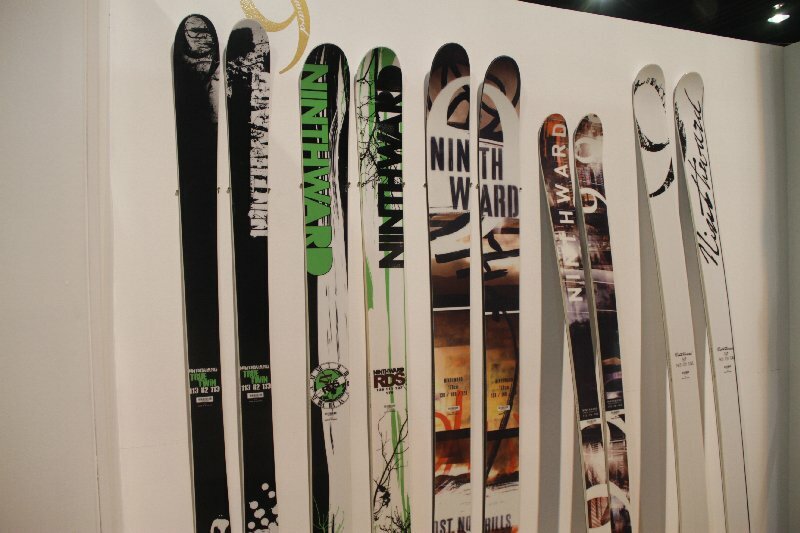 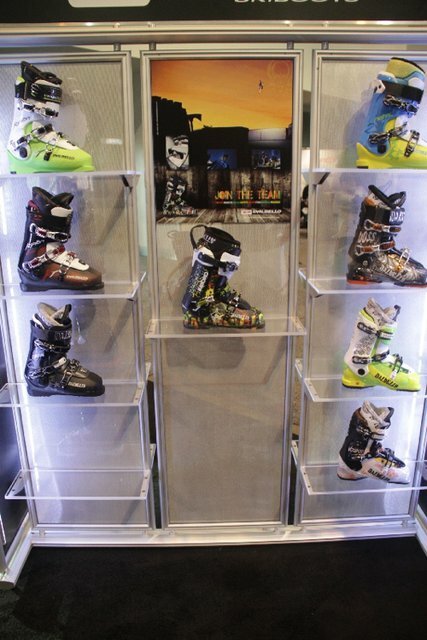 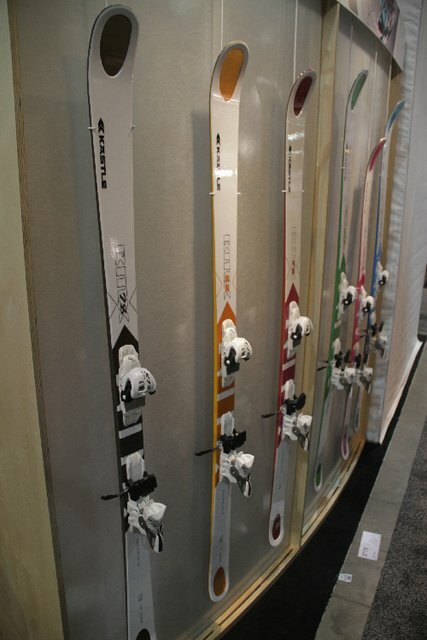 Orage's Mike Nick takes us through next year's Orage pro models. 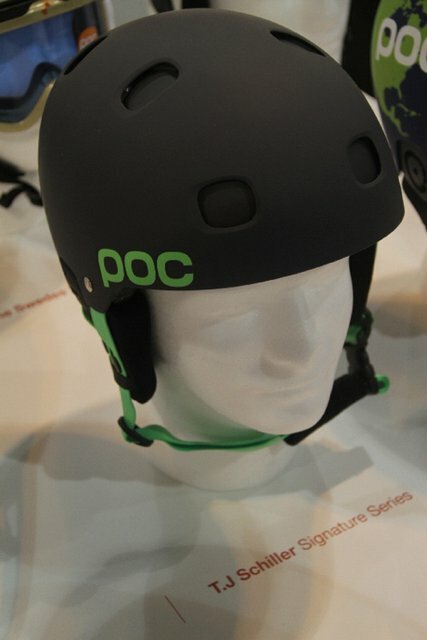 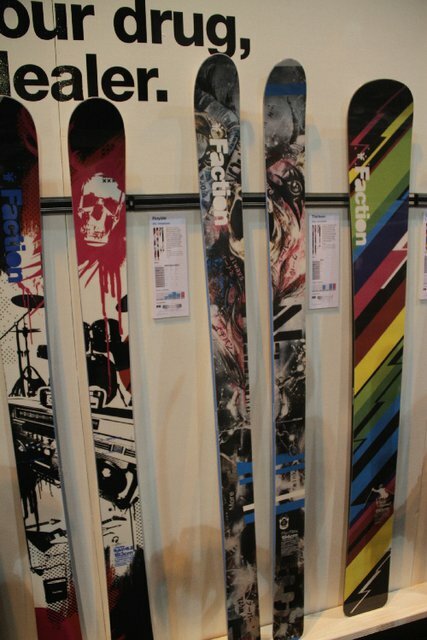 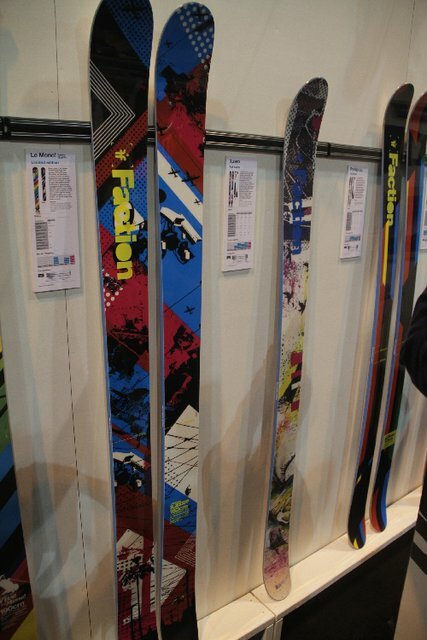 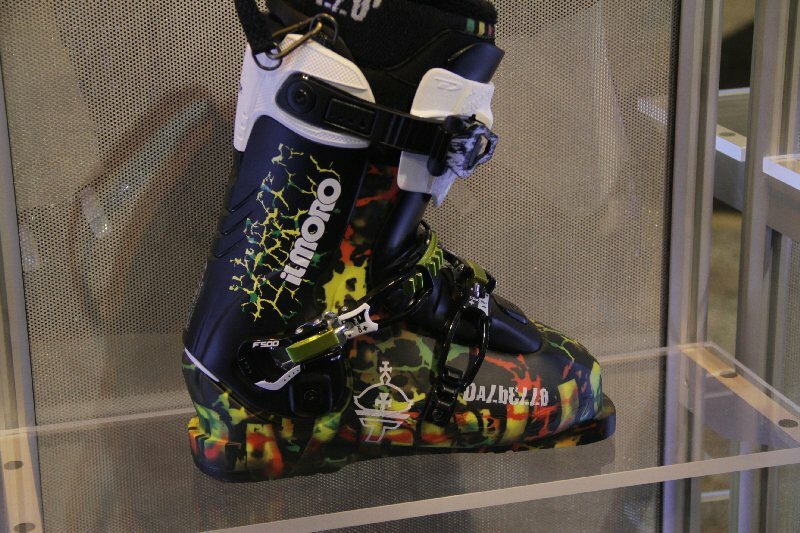 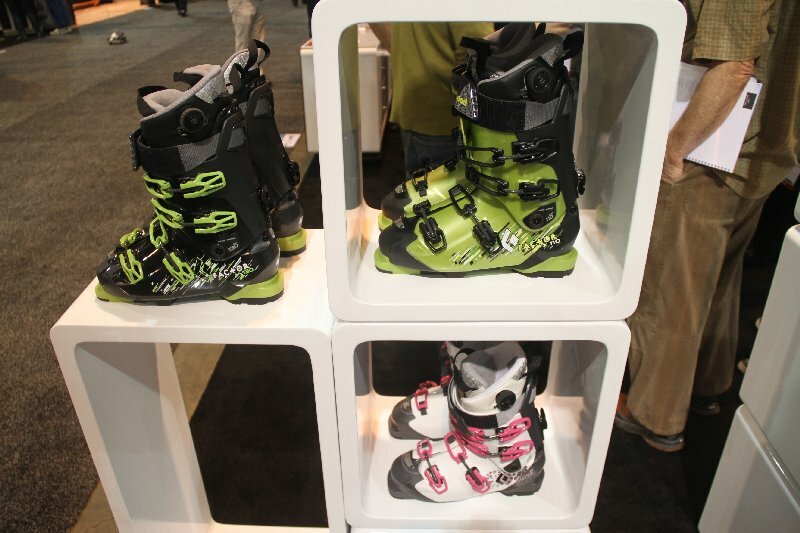 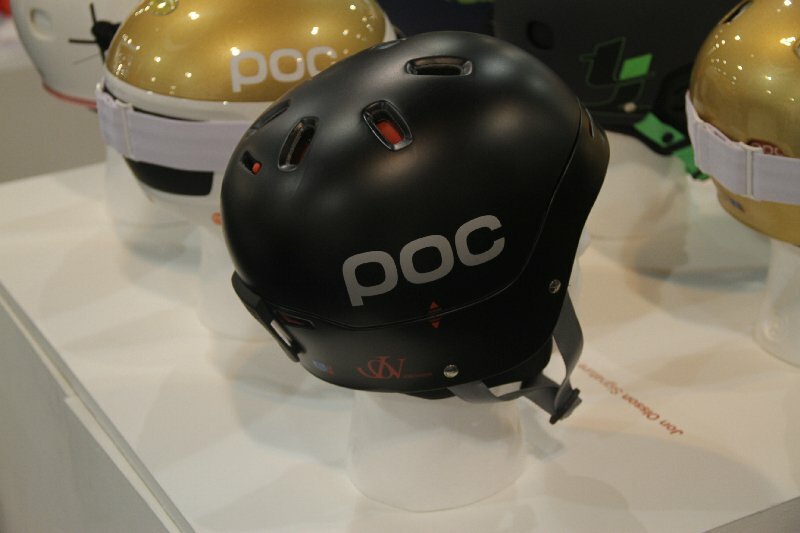 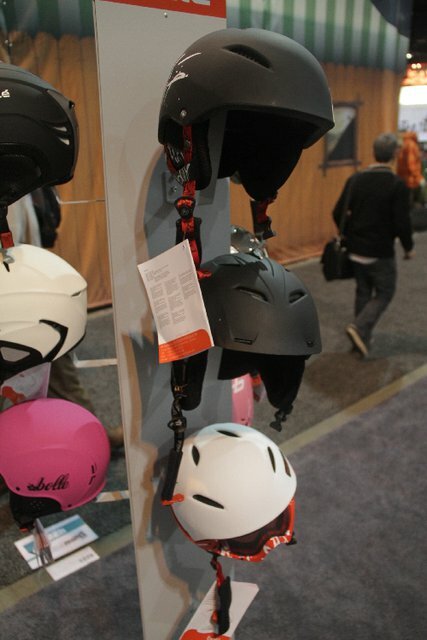 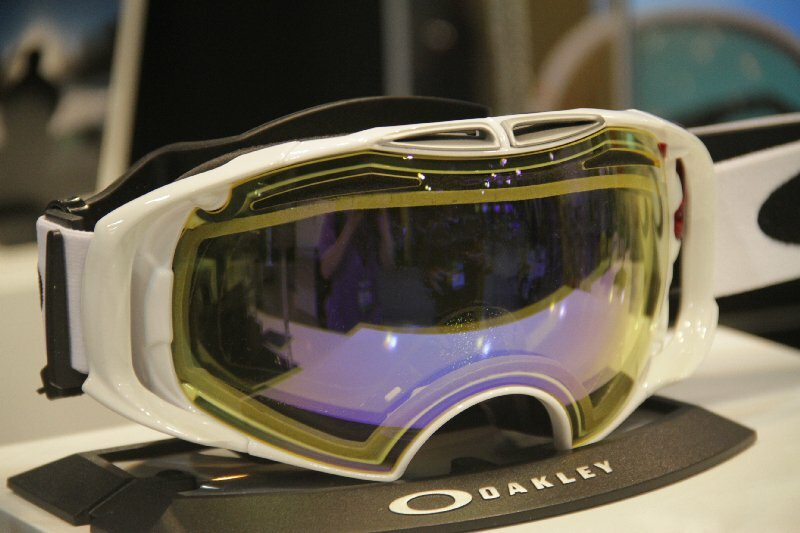 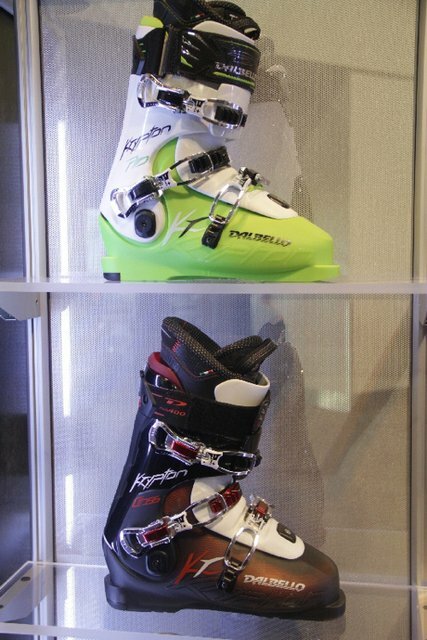 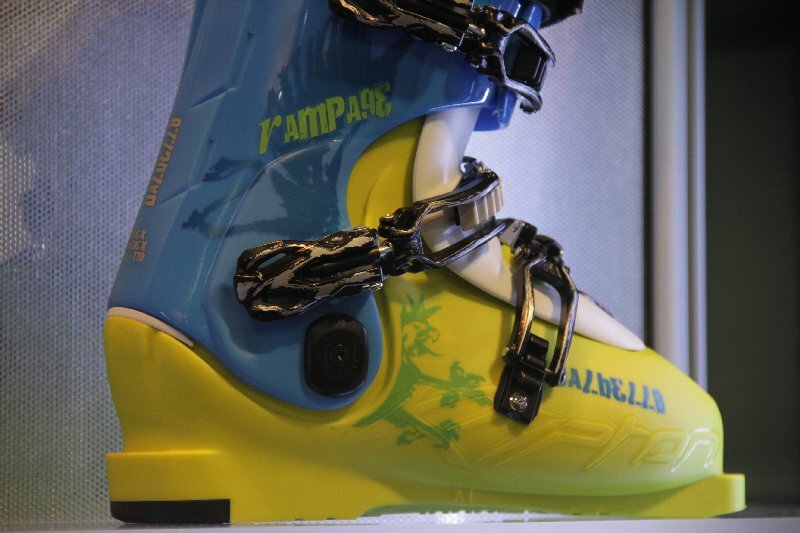 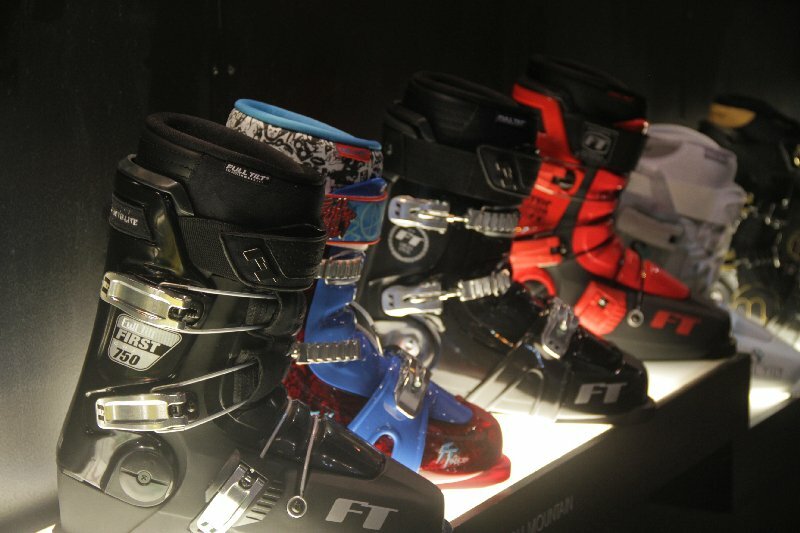 Receptor Backcountry with new MIPS (Multi Directional Impact Protection System) technology. 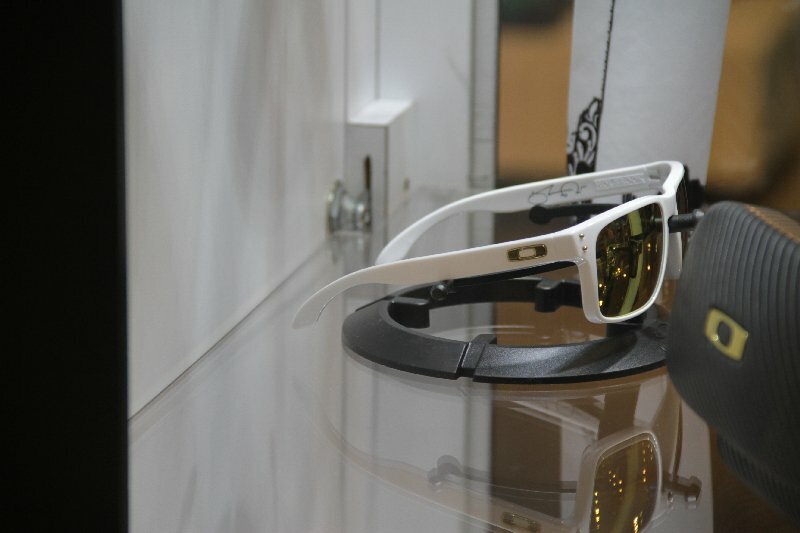 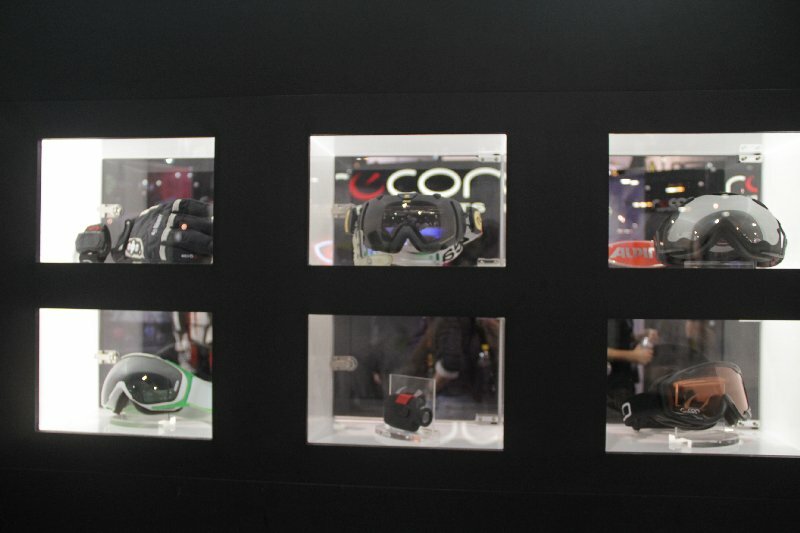 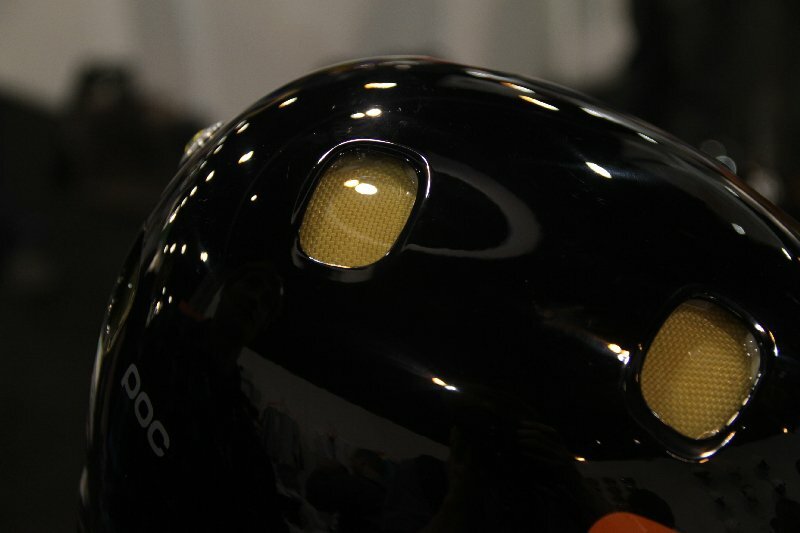 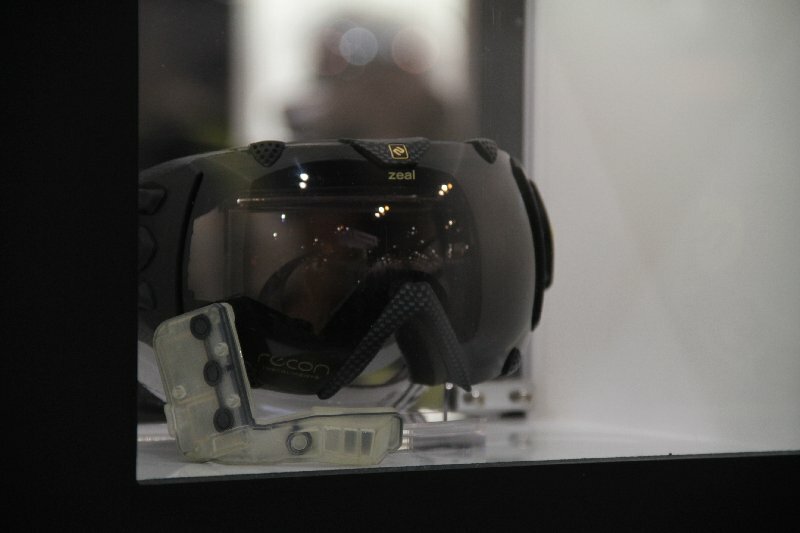 Zeal goggles equipped with Recon's GPS and electronic goggle system. 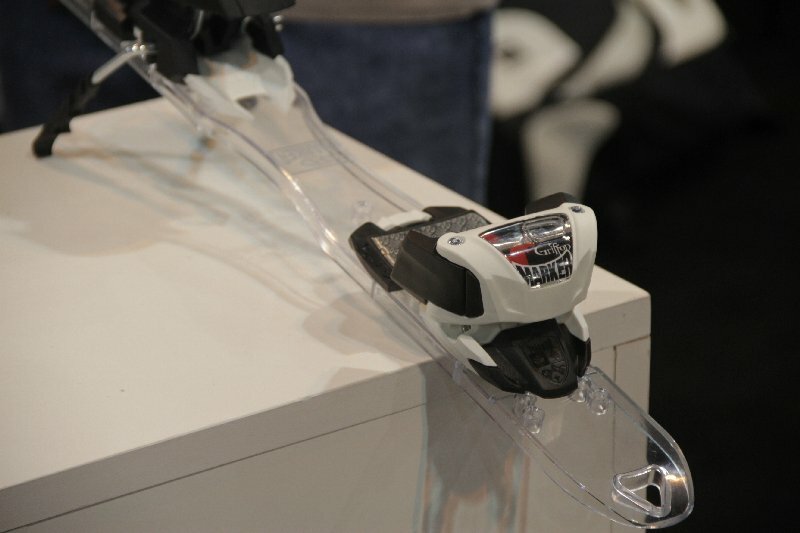 The system measures speed, vertical, altitude and distance. 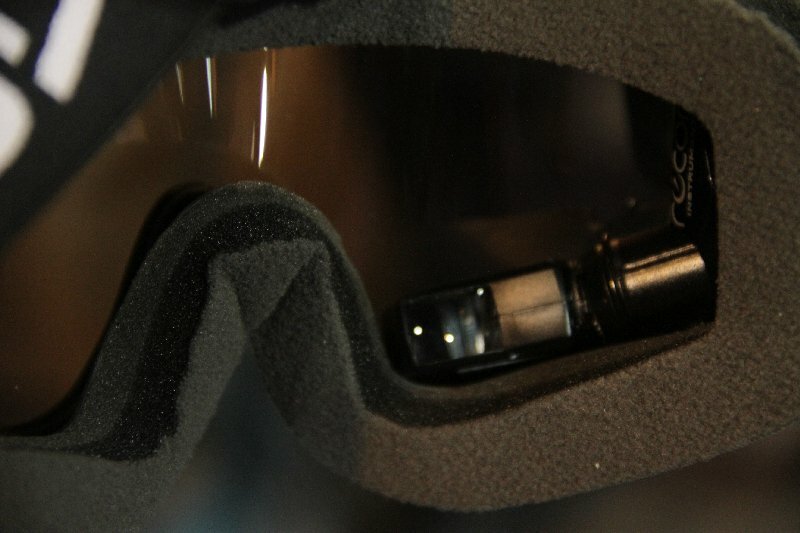 That tiny screen is larger when it's close to your eye, and displays all of the measurements the Recon system takes. 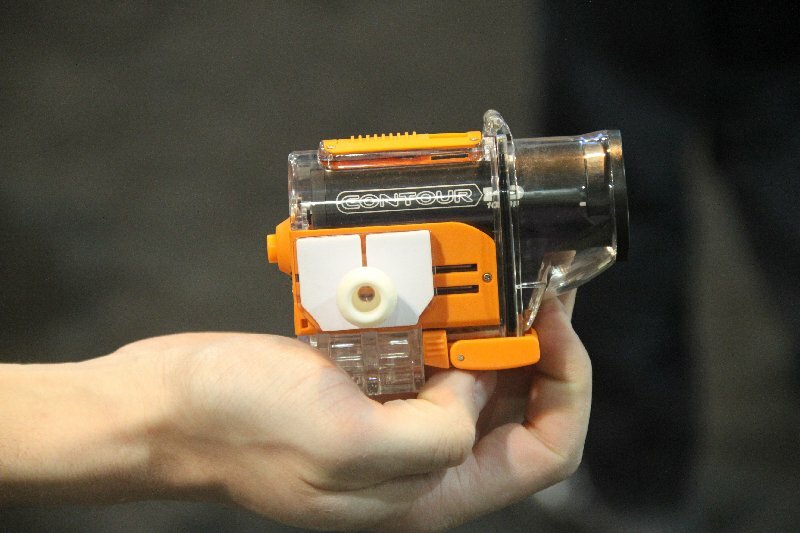 It's small and unobtrusive, contrary to what one might think. 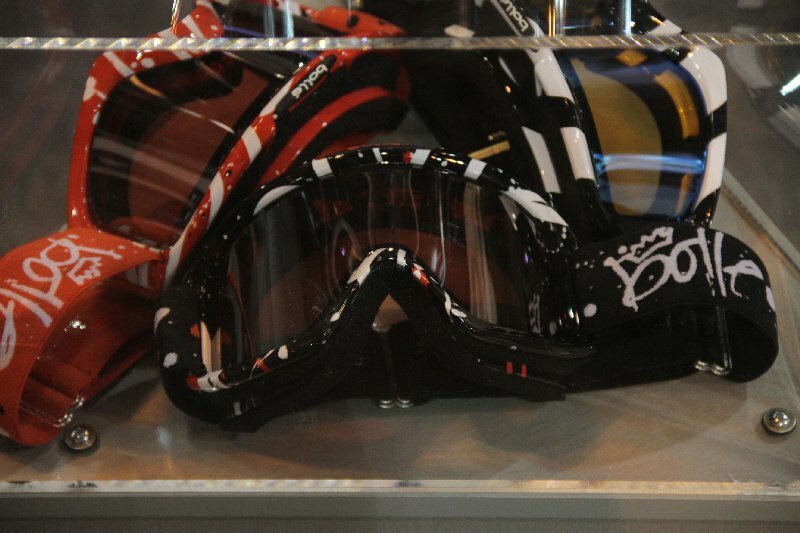 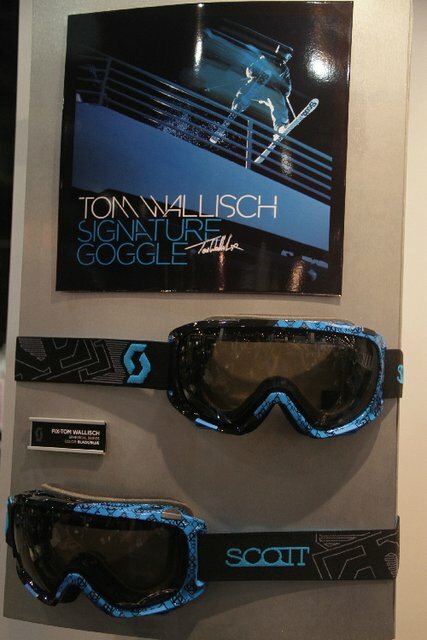 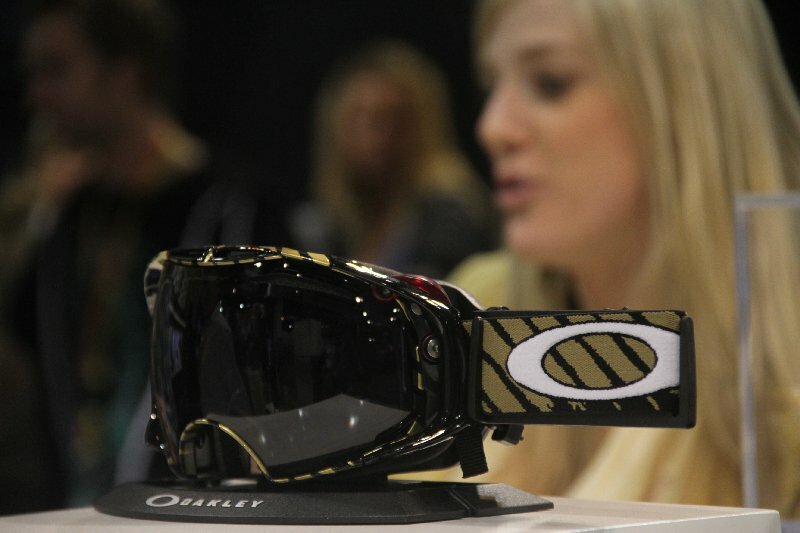 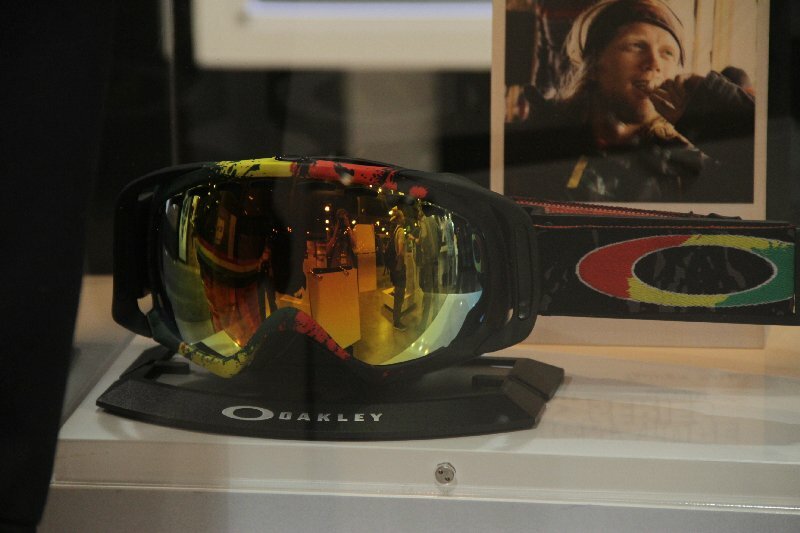 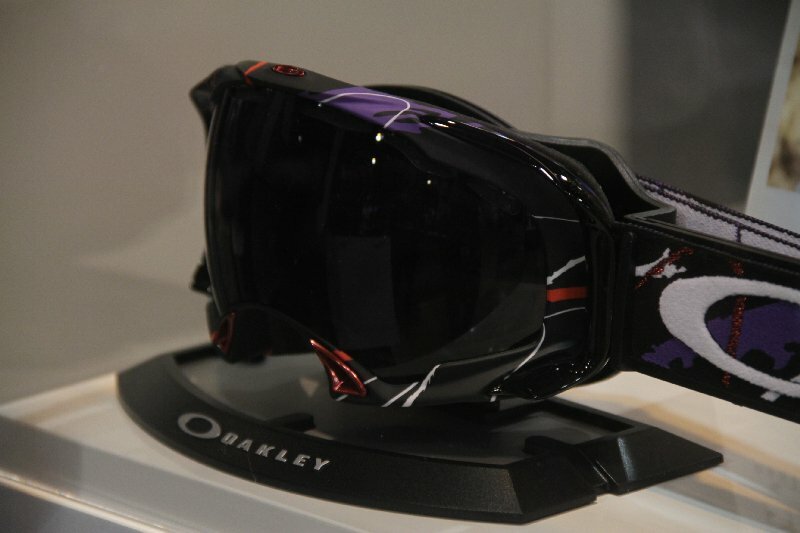 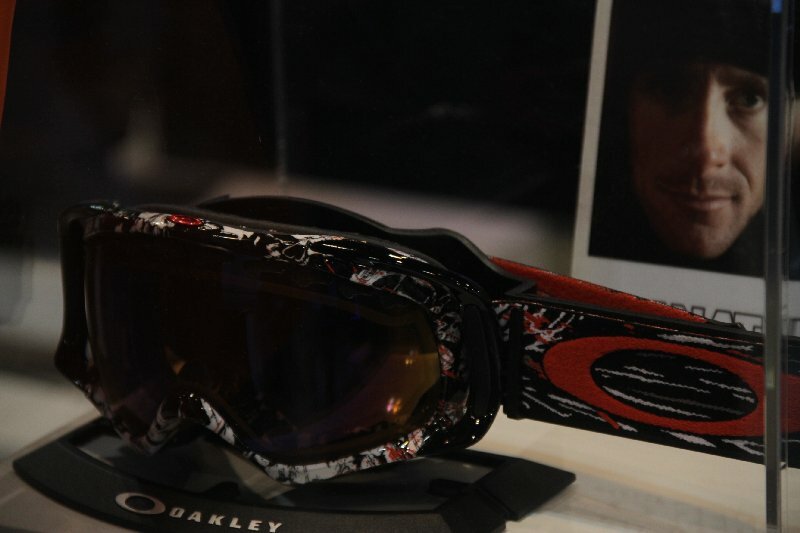 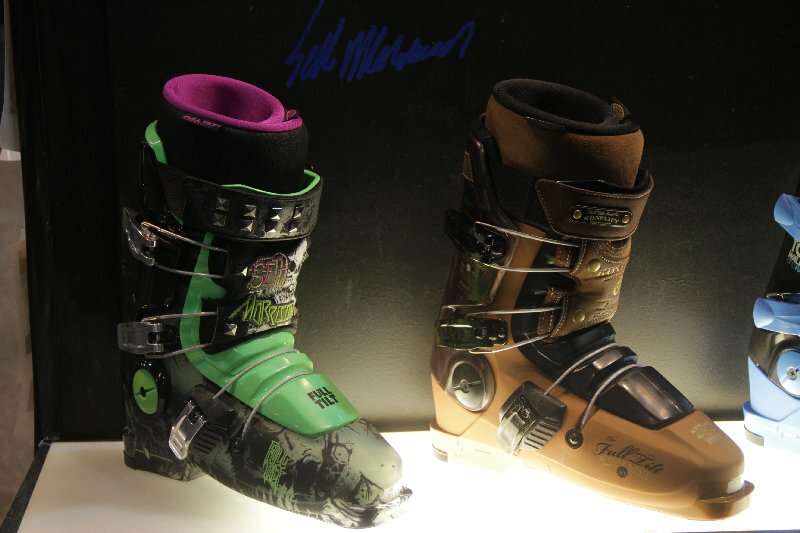 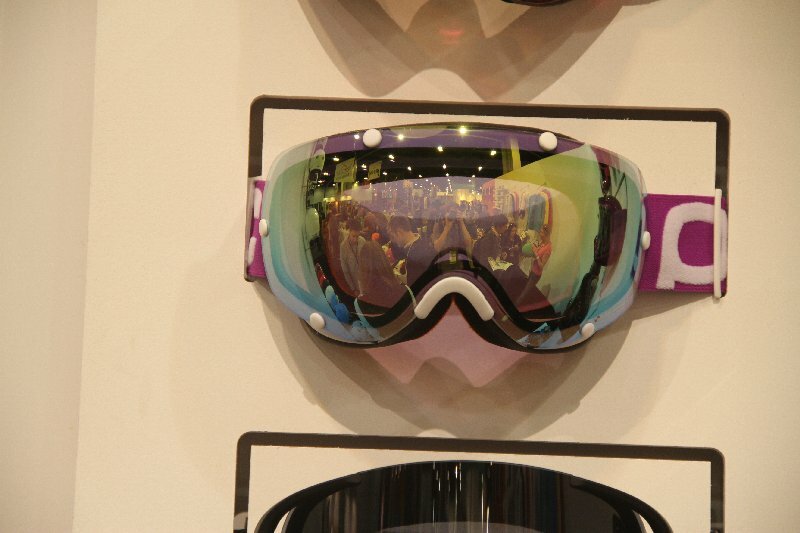 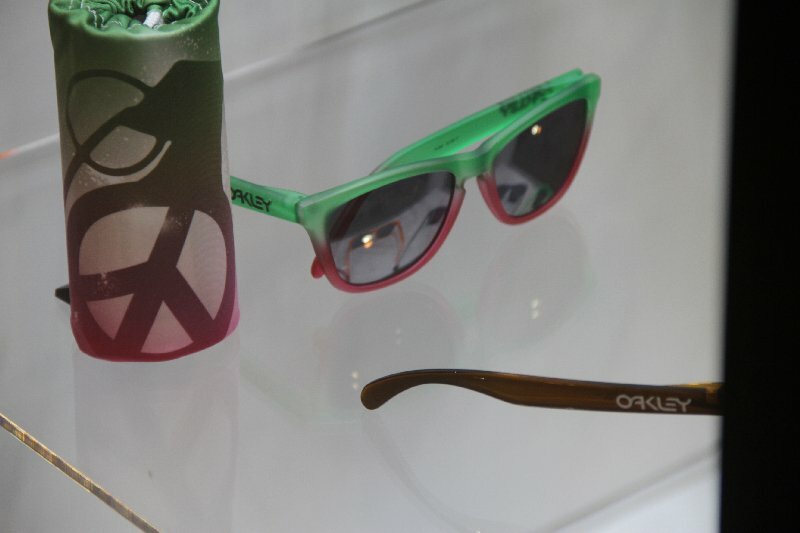 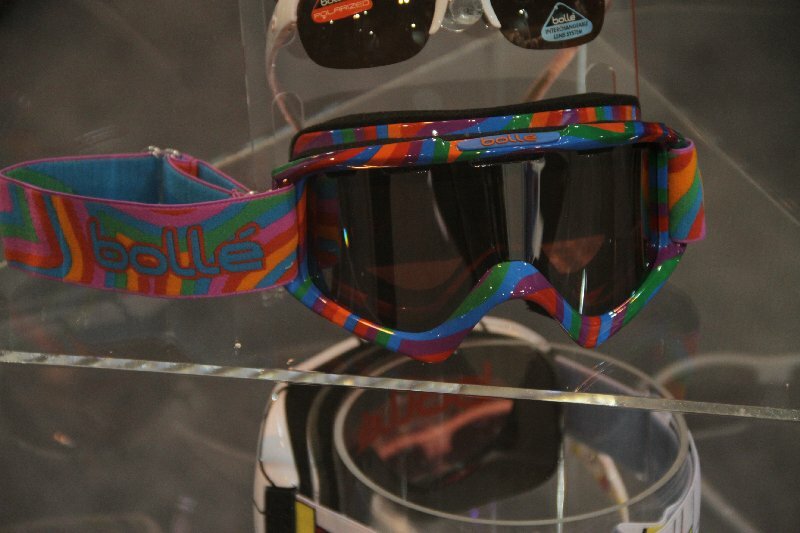 The Hustle and the Hustle Plus goggles; you can see Dane Tudor rocking these gems on the hill. 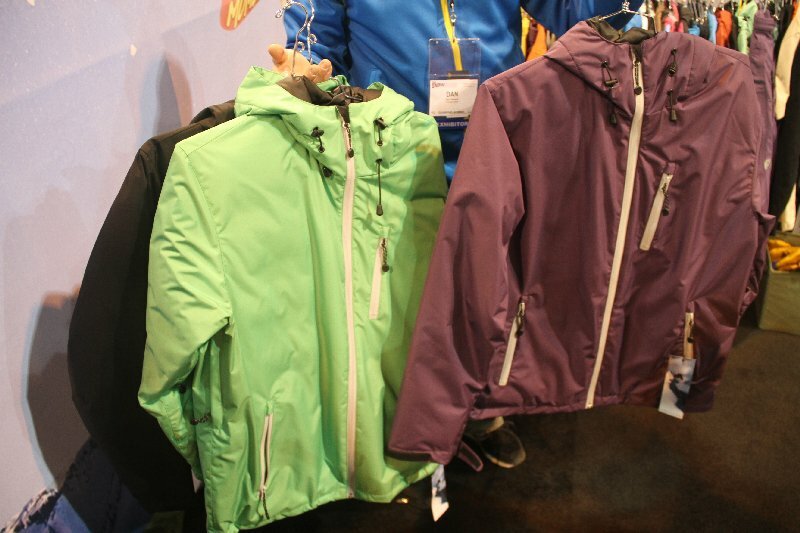 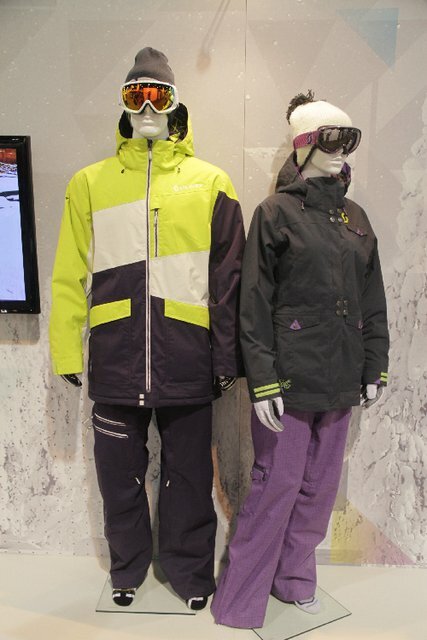 The men's Watson jacket and women's outerwear from Scott. 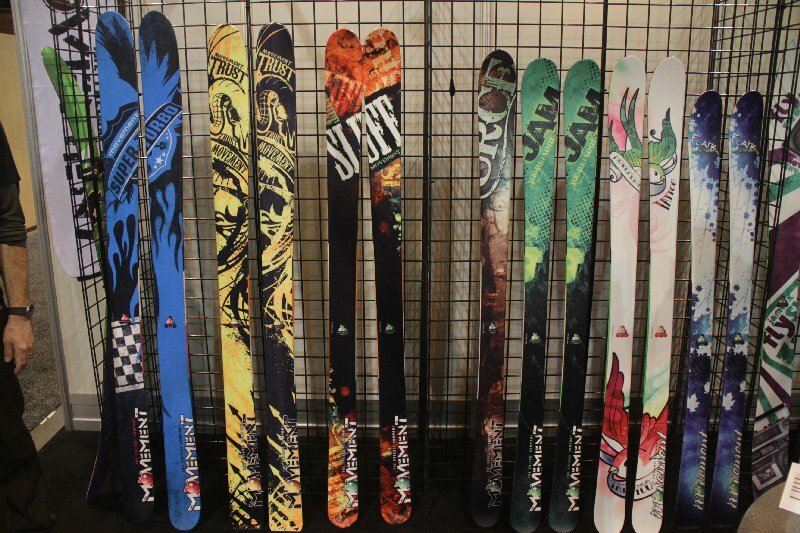 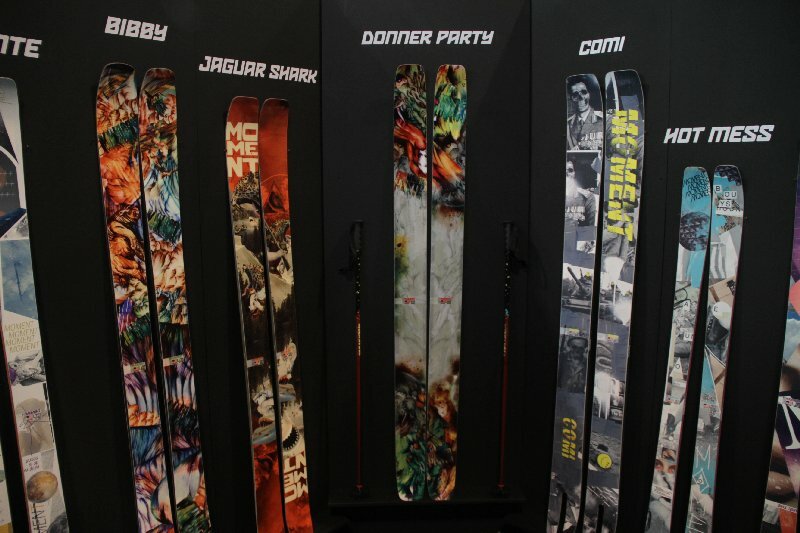 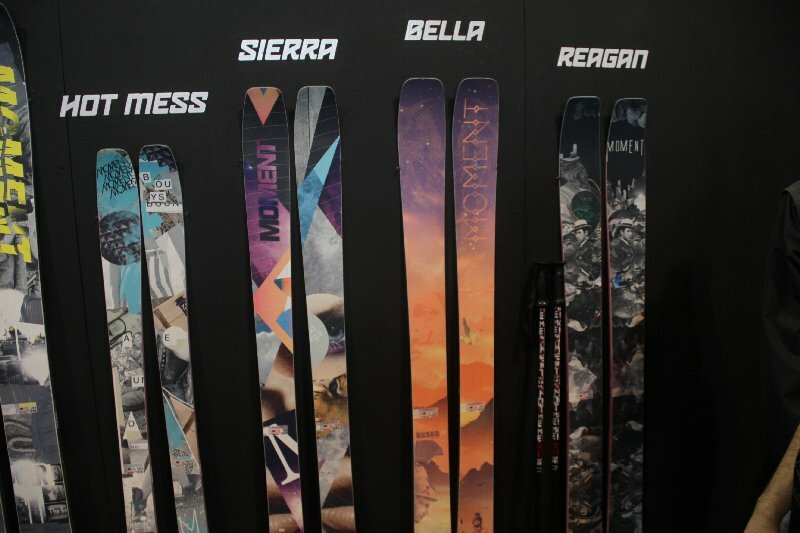 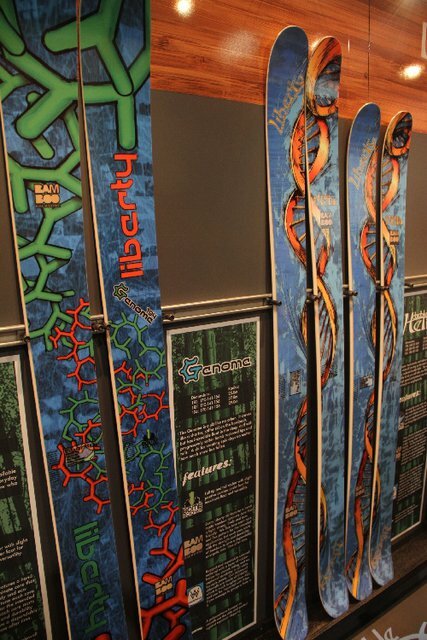 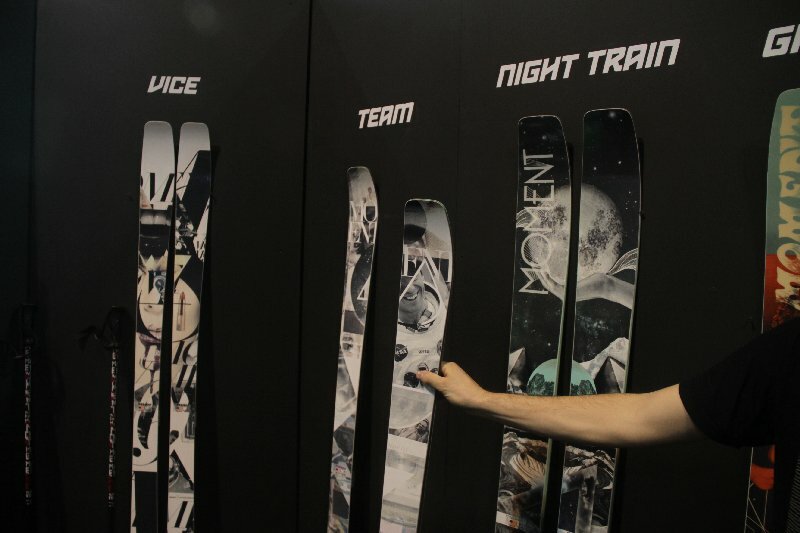 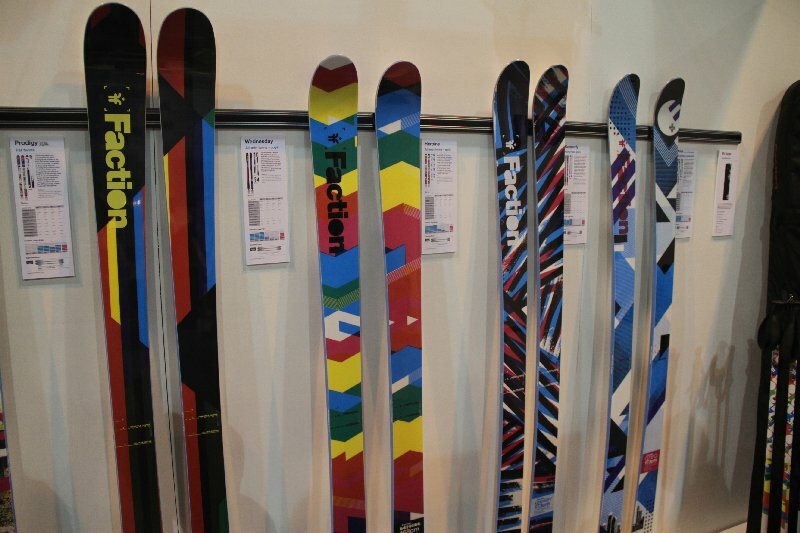 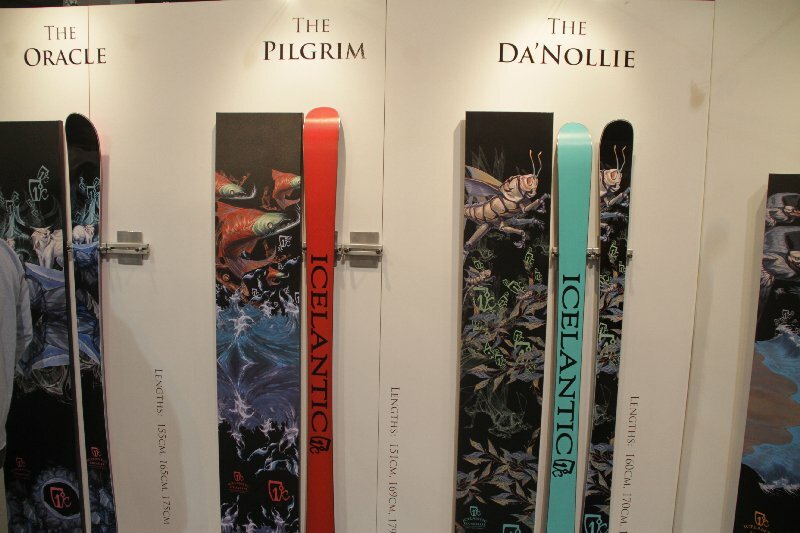 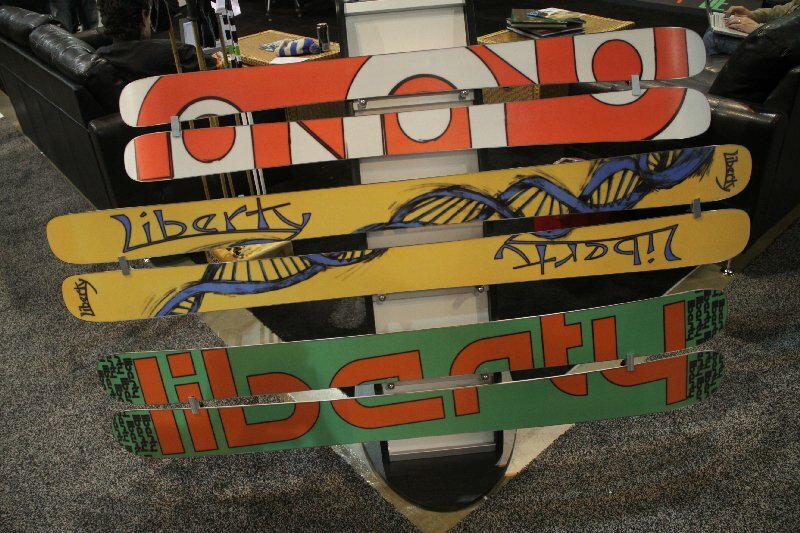 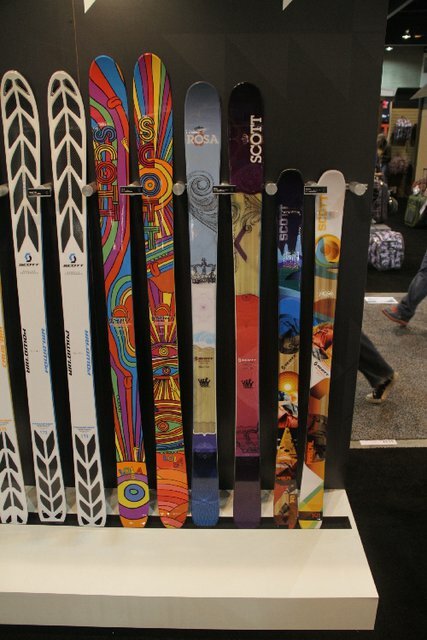 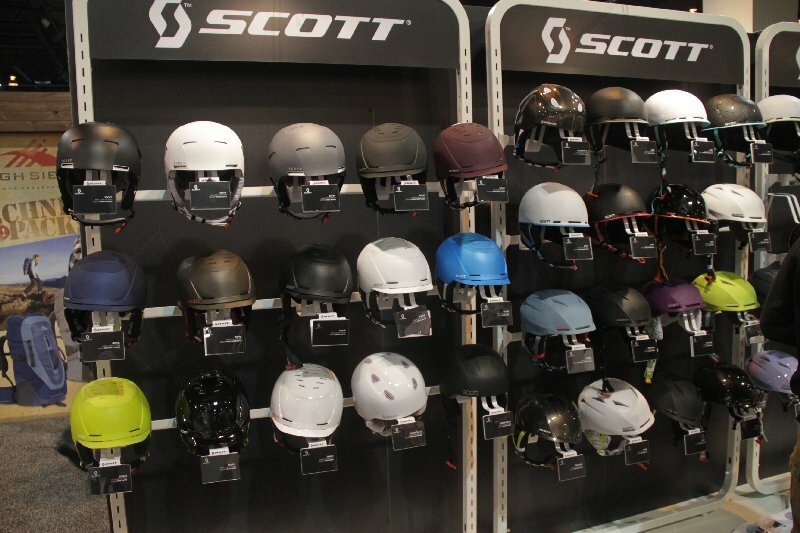 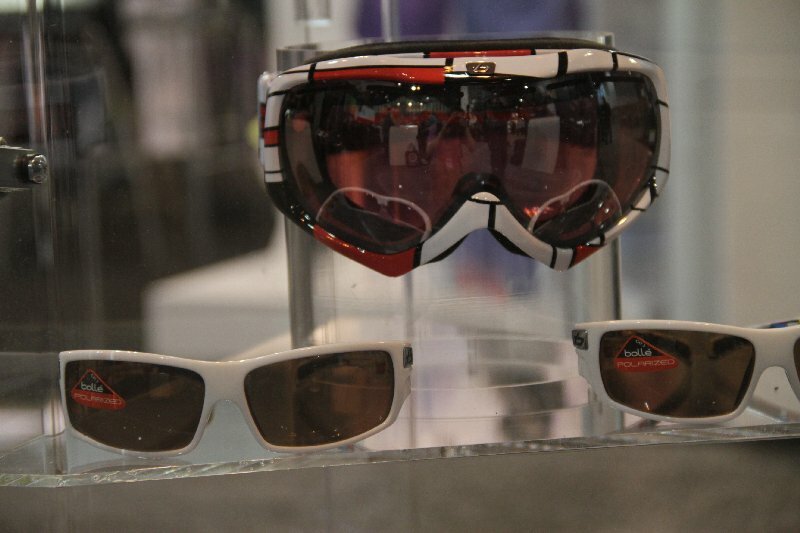 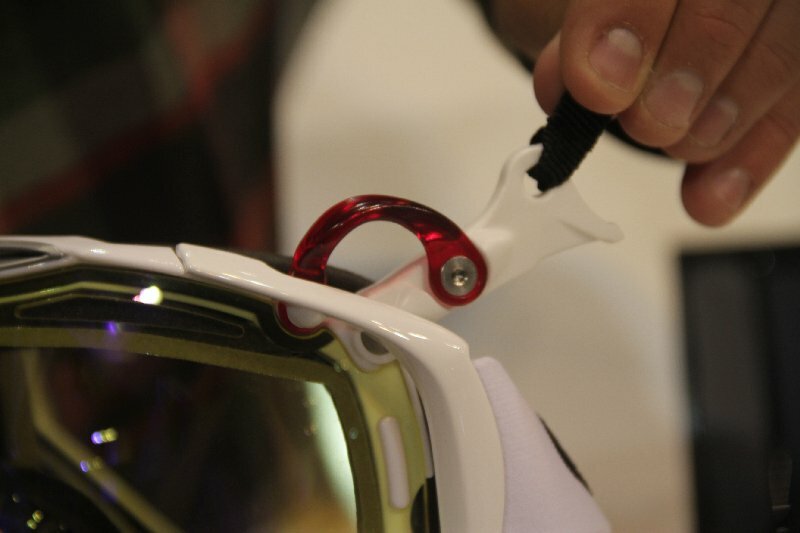 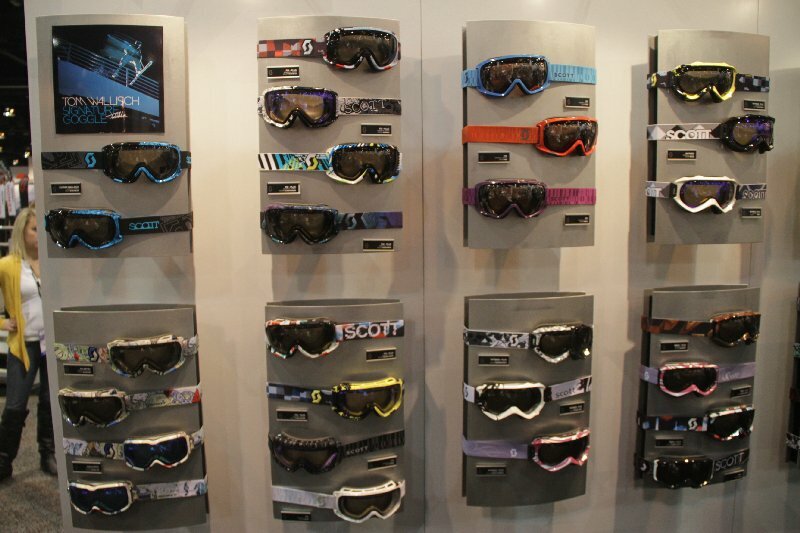 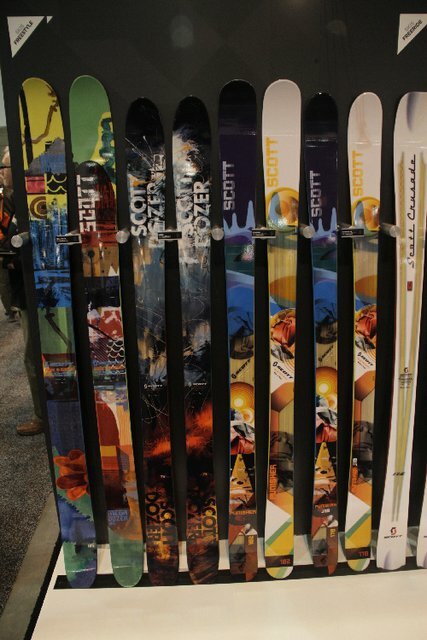 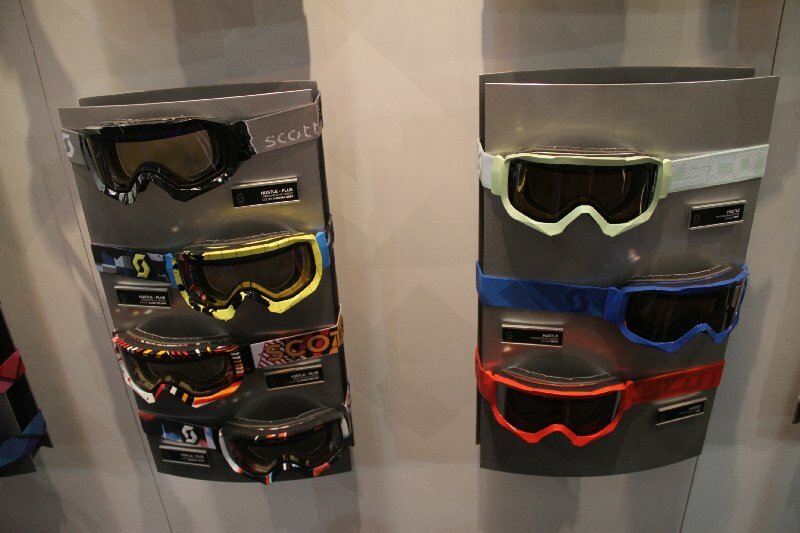 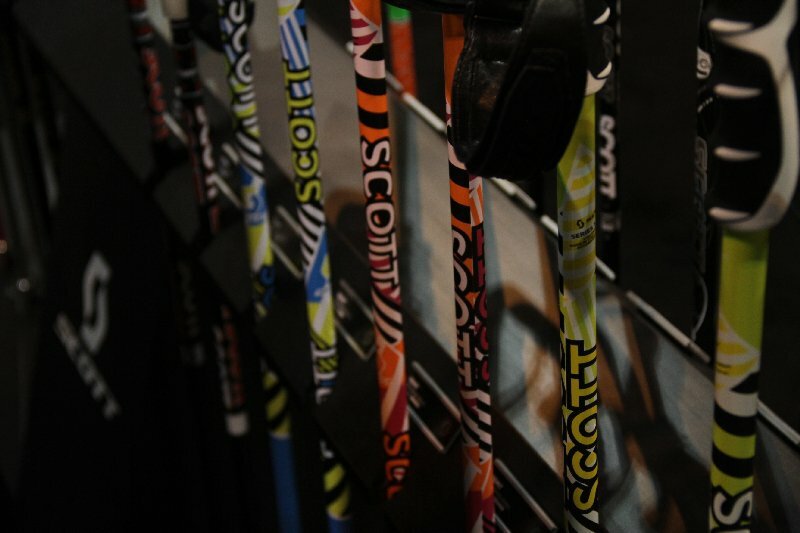 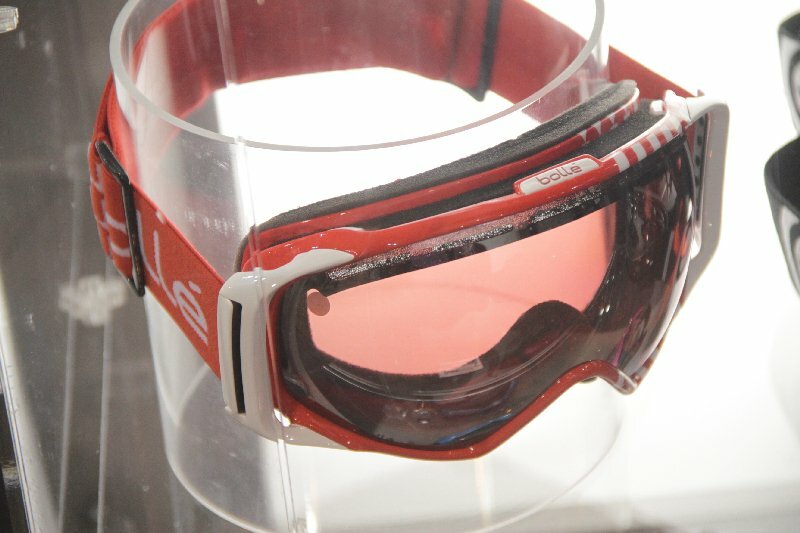 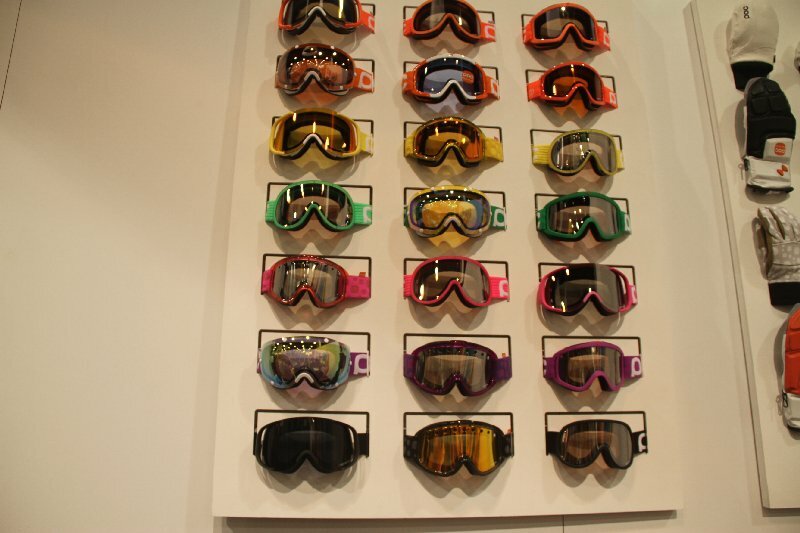 Adam Greene of Scott Sports takes us through the goggles that everyone from Wallisch to Tudor will be rocking, as well as their impressive line up of skis, outerwear and poles. 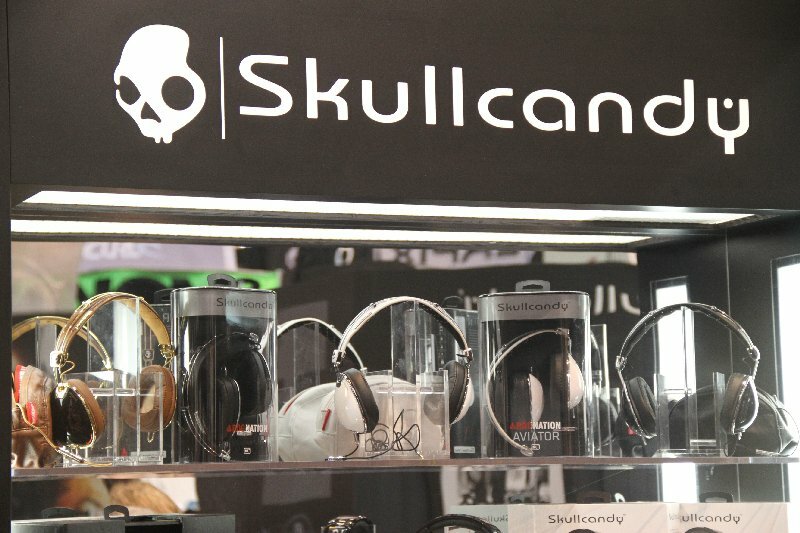 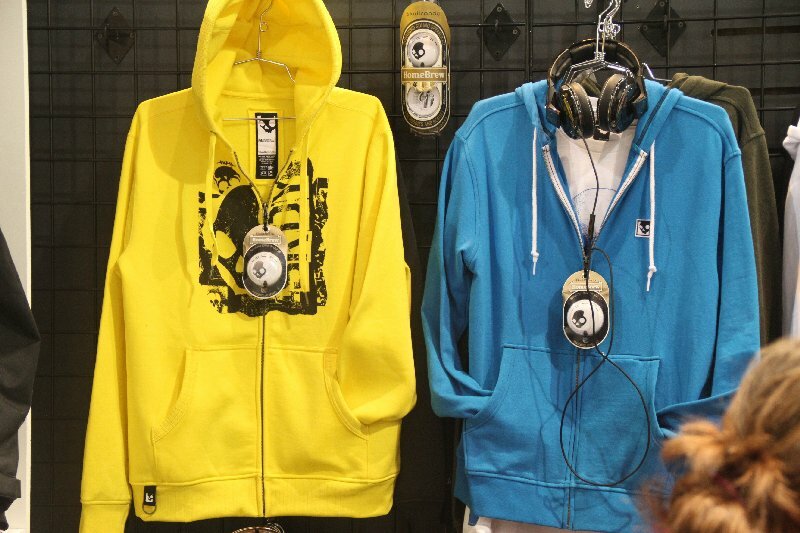 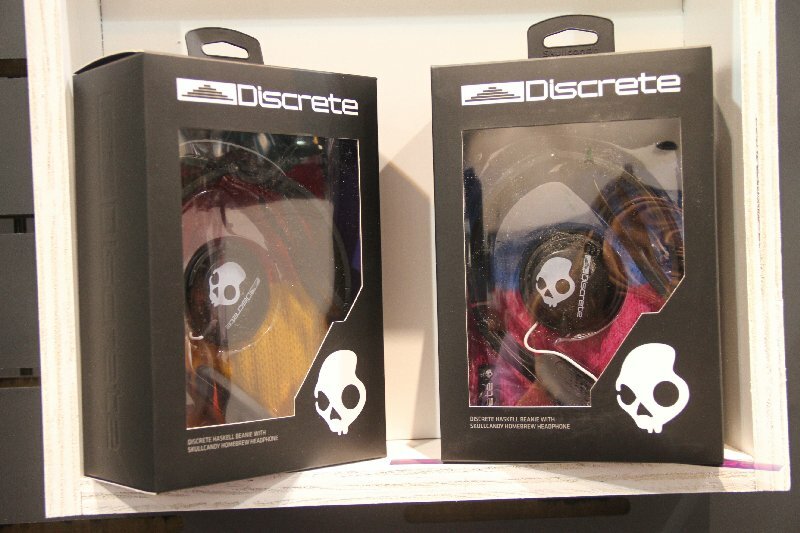 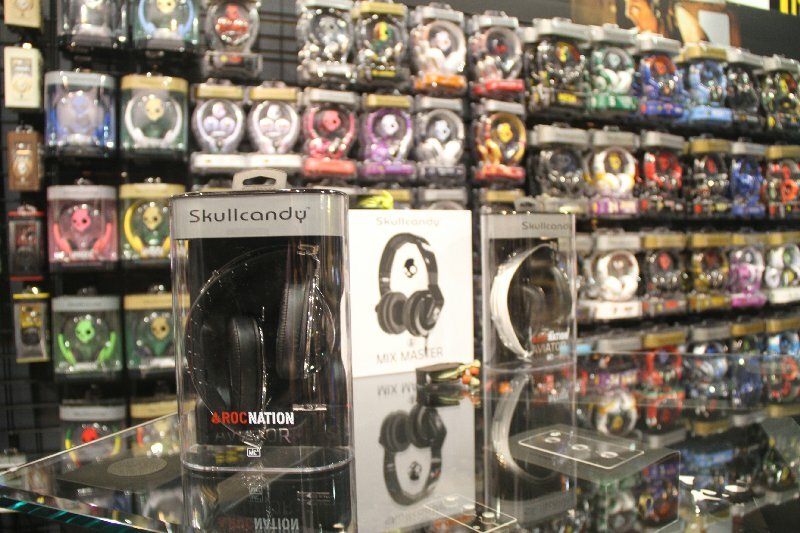 Discrete and Skullcandy have launched a collaborative project. 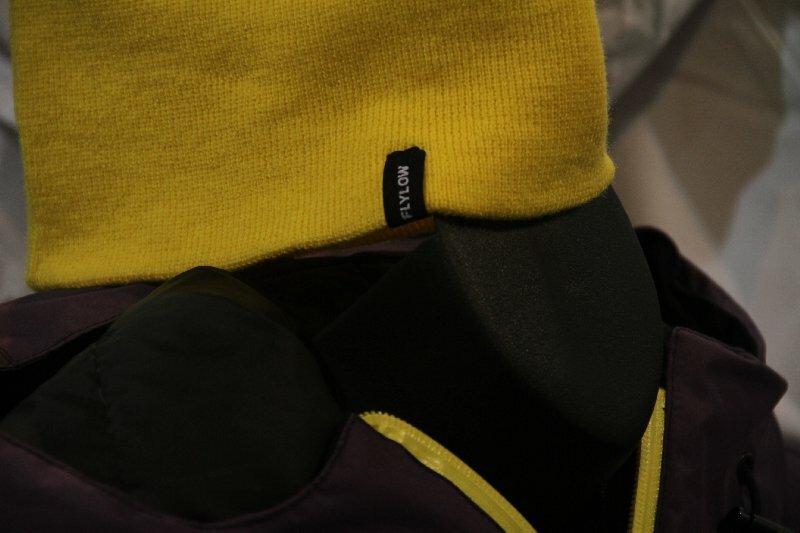 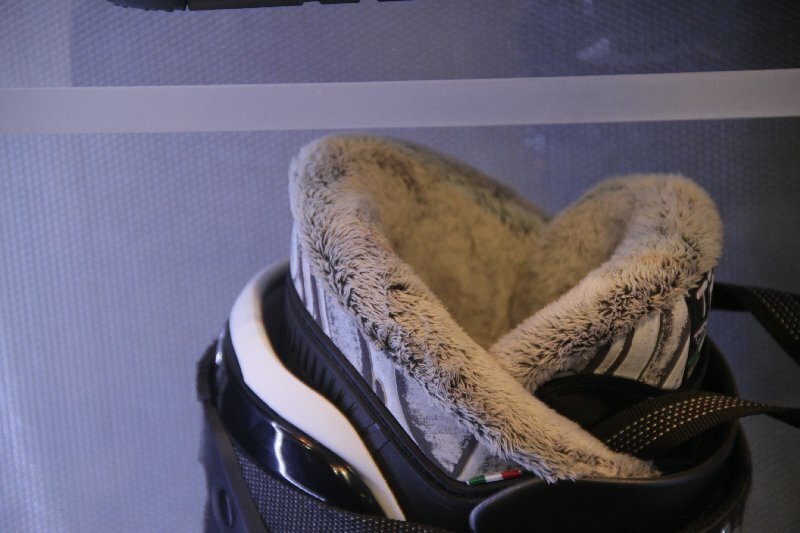 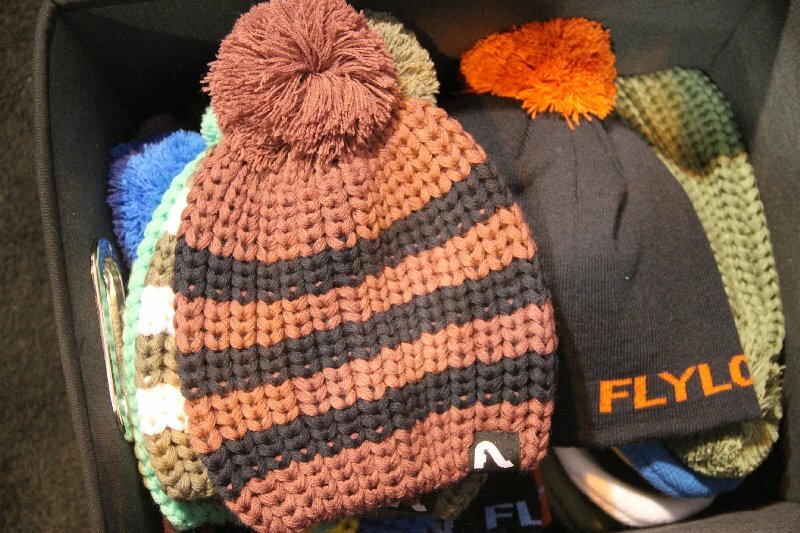 The beanie is fully audio equipped and looks baller. 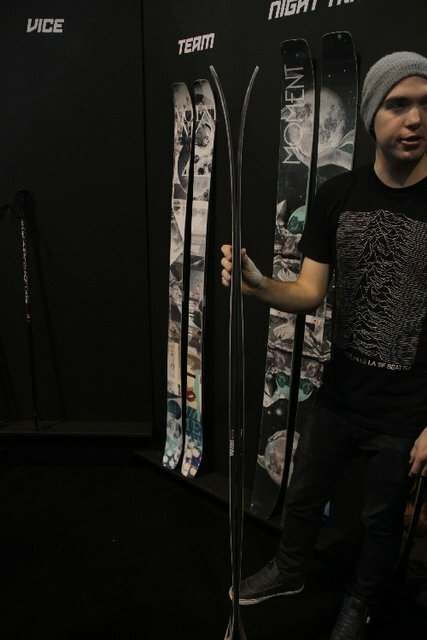 The Uprock is similar to the iCon but is slightly bigger in sound and size. 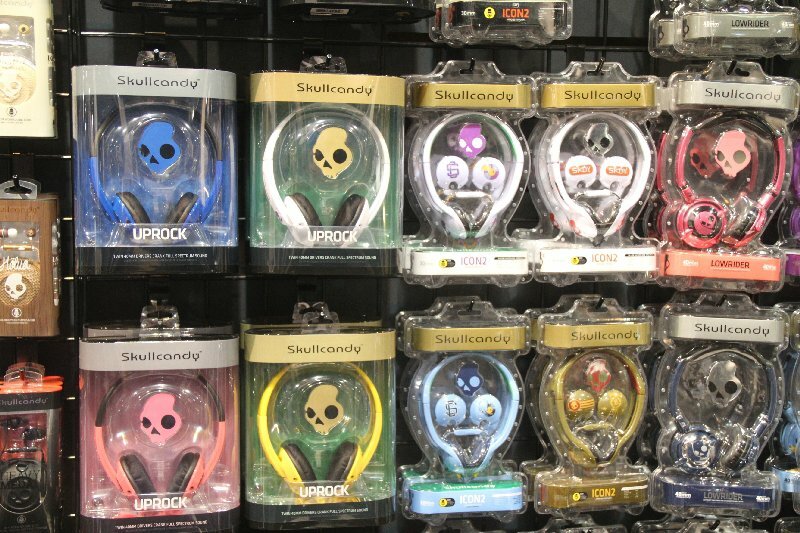 Hang a bottle of Jack from these earbuds and they will still stay in your ears! 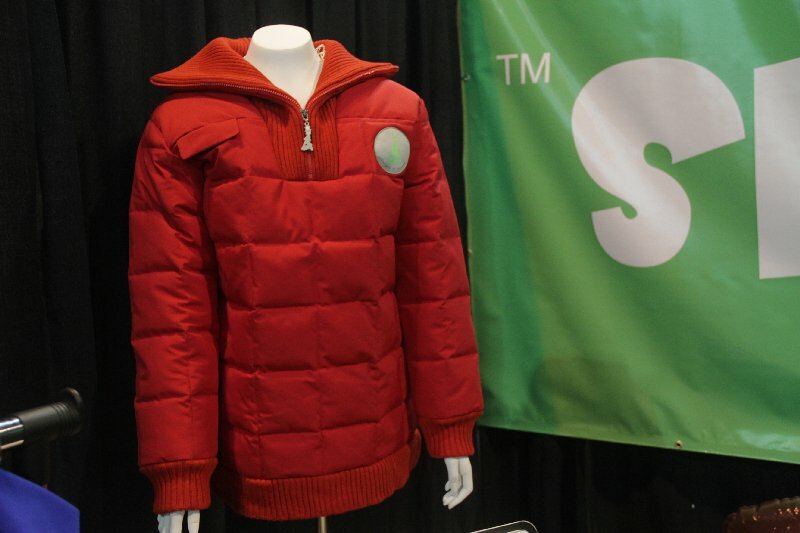 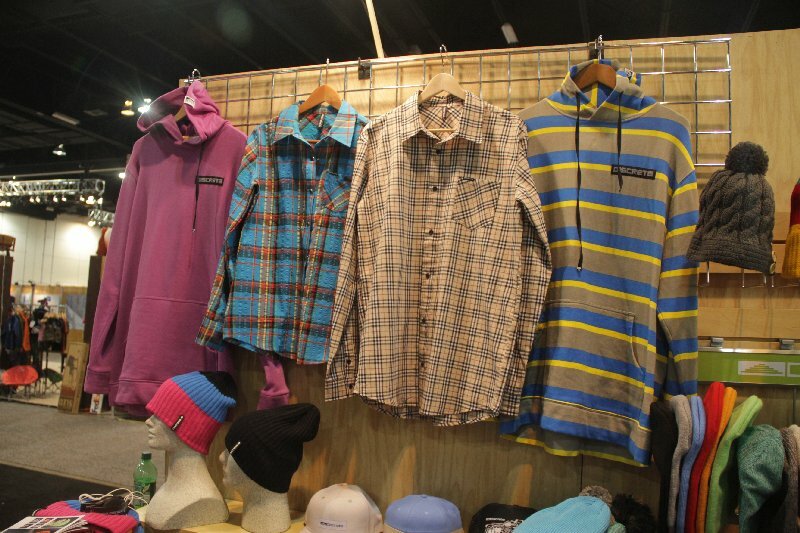 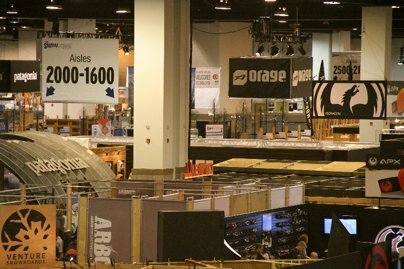 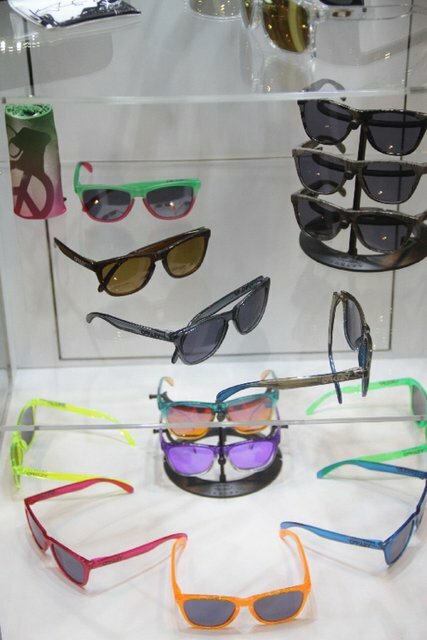 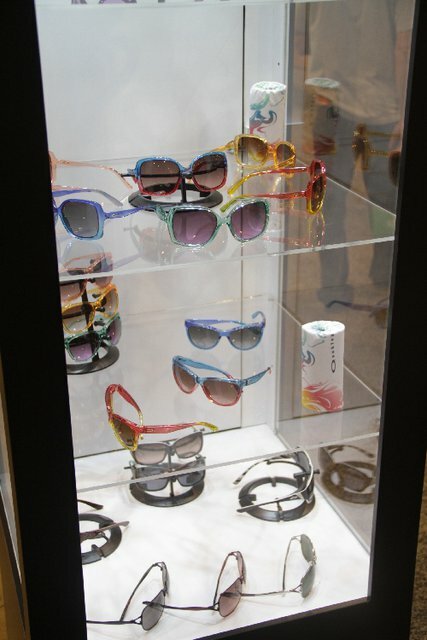 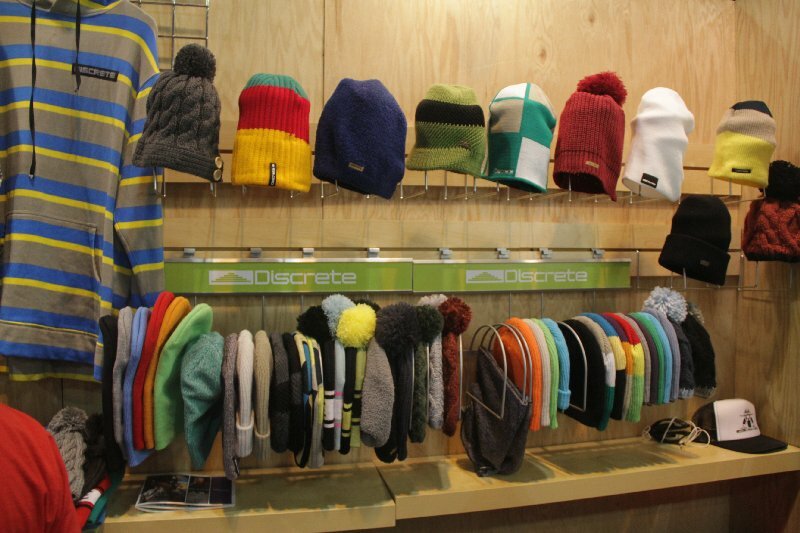 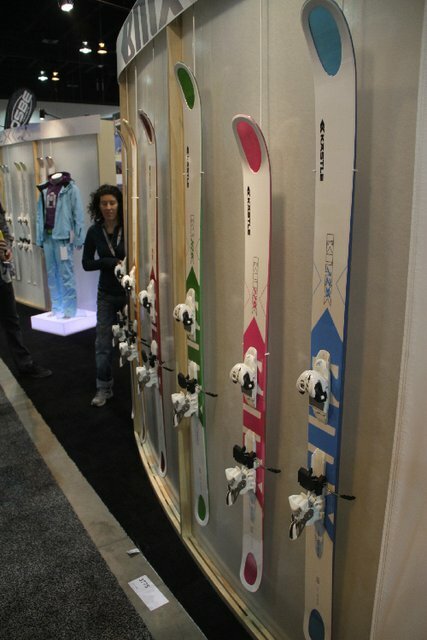 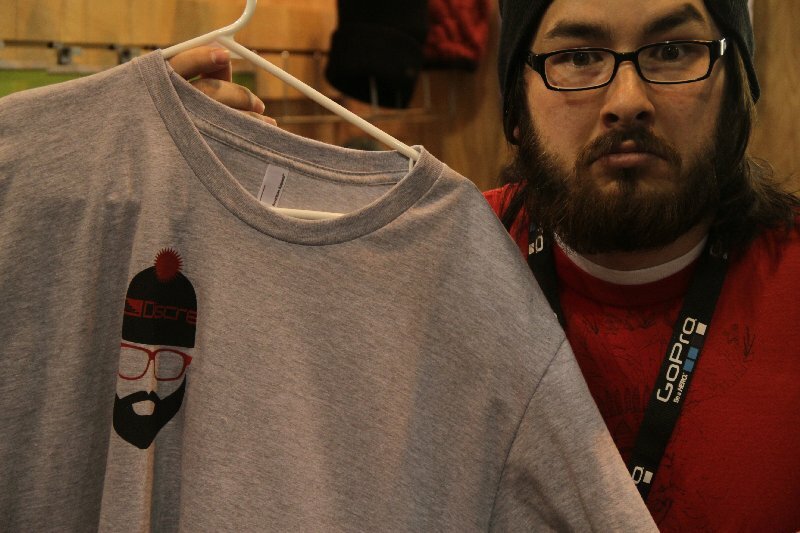 Stay tuned for much, much more from the SIA Trade Show in Denver, Colorado...because we're just getting started!